Blue, Black, Purple, Burgundy and Mulberry were just trying to squeeze in a quick game of No Thanks! before eating, when Green arrived with his parents. They were quickly followed by the first round of food, so it wasn’t until they had finished that the carefully counted piles of chips finally got put to use. The game is very simple: players take it in turns to either take the card on the table or pay a chip to pass the problem on to the next player. If they don’t have any chips left they must take the card when it is their turn (and any chips that are on it). The game ends when the deck has been depleted and everyone scores the sum of the face value of the cards minus any remaining chips—the player with the lowest score is the winner. The game of No Thanks! was a bit incidental around all that excitement. Burgundy took the first card in an effort to get ahead, but it wasn’t the best card to build from. Purple and Blue were forced into trying to build runs from the ends, which is always risky, but can yield huge rewards. This wasn’t going to be one of those times though and Purple’s problems were compounded by the fact that she only discovered the twenty-three in the middle of her long run was missing when it came to scoring. Mulberry was very tempted by some if scoring cards, but despite the fact she was pushed to her last chip, she managed to avoid getting herself into a mess. Black played a very canny game building a small medium value run, not tempted to take a chance on gaps. With everyone finished eating, it was time to decide what to play. Black had suggested that Dixit might be suitable for Green’s parents. However, Green was keen to play the “Feature Game”, Celestia (a remake of the older game, Cloud 9), and as Black was the only one who knew the rules, that meant he was up for that too. Burgundy was less keen, so in the end, as Celestia is better with more players, and to avoid too much shuffling of seats, Blue, Mulberry and Burgundy left everyone else to board the airship. In this game there is no board, instead there are nine city tiles making a path. Players then take on the roles of adventurers exploring the cities of Celestia by airship. At the beginning of each journey a new captain is identified and they begin by rolling the dice to discover the challenges they will face. Before the Captain faces these challenges, however, however, each player must decide whether to stay on board, or leave the airship. At each city there is a pile of treasure cards (mostly just victory points) which get better as the journey progresses. When a player leaves the ship, they take a treasure card at that city, forfeiting the potential riches to come. Once everyone has made their decision, the Captain has to deal with the challenges by playing equipment cards. If the Captain is successful, the airship moves on to the next city where a new captain is identified who rolls the dice and so on. If the Captain is unable to deal with the challenges they face, the airship crashes, returning to the first city and none of the passengers on board get any treasure. Those passengers who left the ship then get back on board for the start of the new journey. When one player has a total of fifty points the game ends. This time, the group added the A Little Help expansion which adds cards that players can use to help out the Captain. There are a few extra cards like The Bandit and The Mooring Line as well, which players who are not on the ship can use to make life harder for those trying to get to the next city. The group also added the lifeboat from the A Little Initiative expansion, which enables players to continue on their journey alone. One of the key parts of Celestia is hand management as cards are scarce. Players start with a hand of cards, six cards in a four or more player game and only get to draw a card when the journey ends, either due to a crash or arriving at the ninth city. With the inclusion of the expansion cards, there seemed to be quite a bit to remember when learning the rules, but as ever, once underway the game flowed and the rules became clearer. Even so there was still a lot of double checking of which cards could be used when. Black and Purple had both played the game before and knew how quickly things could get difficult. So Black and Purple cashed in their travel tickets early in the first round and hopped off the airship quite early on, leaving everyone else wondering if they were missing something as they sailed onwards. In contrast, Green and his parents (who had not played before) stayed on board and as a result took a lot of points. This all seemed a little too easy and on rechecking the rules it became apparent that something was wrong. Players had been drawing cards after arriving at each city as the Captain changed rather than after it crashed, which meant everyone was awash with cards. From then on the group played correctly, but the damage had already been done. The balance of cards had been destroyed, and Green and his mum had an unassailable lead. Green came out he victor with some canny play that allowed him to hop on and off the airship, but it was a hollow victory as those first twenty-five points were not fairly won. The game definitely deserves another try though as it is a clever and fun game when played correctly. While the airship was being filled, Blue, Mulberry and Burgundy debated what they were going to play. Orléans was very tempting, but as Celestia was supposed to be relatively quick, the trio decided to play the shorter Tokaido instead. This is a simple, but very clever game where players are traveling the East Sea Road from Kyoto to Edo (Tokyo), meeting people, tasting fine food, collecting beautiful items, discovering great panoramas, and visiting temples and wild places. The winner is the player who discovers the most interesting and varied things and is the most initiated traveler. The really clever part of the game is the turn order, because the player at the back goes first. Although this is an unusual mechanism, it is not unique and is also seen in Glen More, an out of print game that is getting a face-lift and reprint this year as Glen More II: Chronicles. The idea is that each location on the road can only be occupied by one player. Players only ever move forward and the player at the back has a free choice of which empty location they move to. They can choose to stop at the first empty location which means they will be able to maximise the number of locations they can visit, or they can choose to skip a few locations potentially gifting these to their opponents, but ensuring they stop at the locations they will profit most from. Thus the game is all about optimising movement, compromising visiting the best locations, visiting the most locations and preventing opponents visiting the locations they want by getting there first. Each player starts with a character card which gives them a different start condition and a special power. Burgundy was positioned at the front playing Yoshiyasu enabling him to draw a second card whenever he encounters someone, and choose which one to keep Encounter cards give a one-off bonus, so being able to choose instead of relying on random draw is a nice advantage. Mulberry started in second position on the track and as Kinko, was able to pay one Yen less for her food at mealtime. There are several stops for food along the way and money is always scarce so anything that saves money is always good. Blue began at the back (and therefore started), playing Sasayakko who gets the cheapest souvenir for free whenever she buys two or more when visiting the Village. In this game, it is essential that players make the most of their special powers, so Blue visited as many Villages as she could, collecting as many sets of souvenirs as she could. To do this though, she need lots of money and money is not easy to come by. Similarly, Burgundy stopped to make as many encounters as he could and coupled this with visiting the Hot Springs. Hot Springs simply give a two or three point card drawn at random from a deck, with the three point cards depicting monkeys playing in the spring. Somehow, every time Burgundy drew a Hot Spring card, it featured monkeys, while Blue and Mulberry received no monkey-love; after his fifth card it was something they really began to resent. Mulberry was the first to score points and Burgundy wasn’t far behind. Blue was slowest off the mark, but eventually caught up and overtook the others, romping into the lead, helped by Burgundy who persisted in moving Blue’s token when he scored points. That wasn’t the full story, however. At the end of the game points are awarded to the players with the most Hot Spring cards, the most Encounter cards, the most Souvenirs, for donating money at the Temples, and for the player who spent the most on food. With Burgundy taking the vast majority of these points, he caught up and, after several recounts, both Blue and Burgundy finished on eighty-one points with Mulberry not far behind. With more achievement cards, Burgundy was the clear winner, but he’d tried to be generous with his points throughout the game and insisted on sharing victory with Blue (to go with the lack of sleep they shared). Celestia was still going and wasn’t looking like it was going to be finished very soon, so Blue, Burgundy and Mulberry decided to try something else. After a bit of discussion, they opted for a new game by the producers of the Spiel des Jahres and Deutscher Spiele Preis winner, Azul, that had been brought back from Essen late last year. Blue had played Reef with Pink, Black and Purple after The Gallerist during a recent “Monster Games” session, but otherwise it hadn’t made it to the table. It isn’t a complex game though and is very quick to teach: on their turn, players can either take a card from the pool of face up cards, or play a card, adding the pieces of coral depicted in the top half to their reef and then scoring the pattern shown in the bottom half of the card. The reefs are a three by four grid and the pieces of coral can be played anywhere and can stack up to a maximum height of four. Scoring the patterns is as viewed from above, and each one can be scored several times with different patterns worth different numbers of points. This means there are two approaches to the game, scoring low but frequently, or building to one large score. Mulberry opted for the first approach and facilitated this with single colour piles of coral. Blue tried the alternative strategy, building to a large twenty-plus point score, while Burgundy tried a mixture. As a result, Mulberry quickly built up a healthy lead, and the question was whether the others would catch her or not. It was close, very close, with just four points covering all three players. This time though, little and often was the winner, and Mulberry finished with forty-two points, one more than Burgundy. Celestia was still going, so Mulberry stayed to play one last game, San Juan. This is an old game from the Alea Small Box Series that is sometimes referred to as the card game of Puerto Rico. The idea is that on their turn, the active player chooses a role, Builder, Producer, Trader, Prospector, Councillor and then everyone takes it in turn to carry out the associated action. The person who chose the action gets to use the privilege of the role (pay one less for building, trade or produce one extra item etc.). One of the clever things about the game is that cards have multiple purposes, similar to Bohnanza where cards can be money or beans. 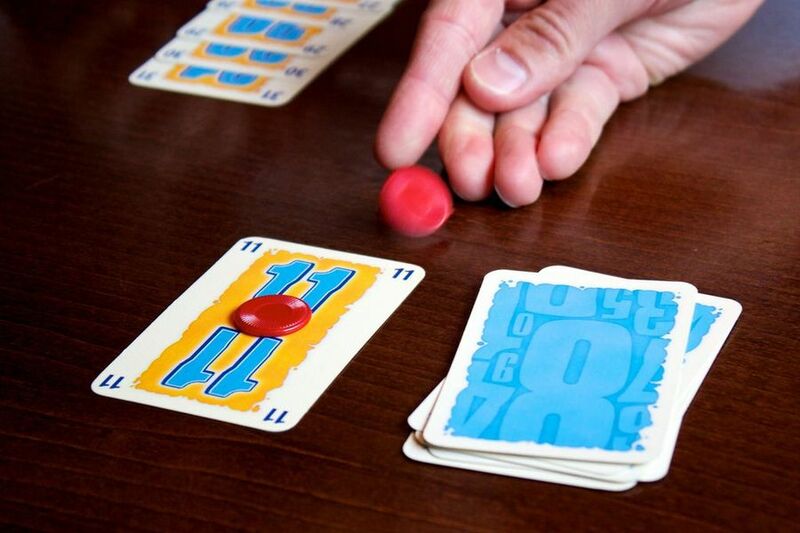 In San Juan, each card can be played onto the table as a building, but when in hand they can be used as payment, and during the game they can be used as produce as well. Each card has a value when built and there are a small number of special buildings whose score depends on the other buildings in play. The game ends when a player builds their twelfth building. Mulberry was tired and really struggled, so Blue and Burgundy tried to help explain what she could do, certain she’d get the hang of it. They stressed the importance of not getting left behind on the building, a message Mulberry took to heart, building at every opportunity. Blue made life difficult for everyone though, building a Guardhouse reducing everyone else’s hand limit to six. Burgundy saw one of the valuable six point plus violet building cards early in the game, but that was it, so he ended up building lots of production facilities. Blue on the other hand built lots of violet buildings and with it a City Hall giving her one point per violet building. In the meantime, Mulberry kept building so when Blue failed to spot she had eleven buildings she accidentally triggered the final round. It was very, very tight, but somehow, Blue just kept her nose in front finishing with twenty-three points, one more than Burgundy and two more than Mulberry. In the meantime, Celestia had finally come to an end. With Green and his parents wanting to leave and Pine finally putting in an appearance after a long day bird watching in the West Country, the group we went for a very short game, one about birds: Pick Picknic. 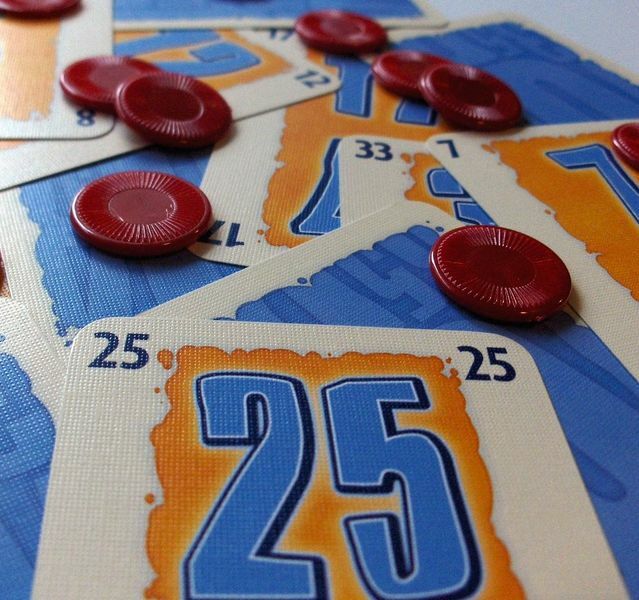 This game combines simultaneous card selection with bluffing and a slice of luck. 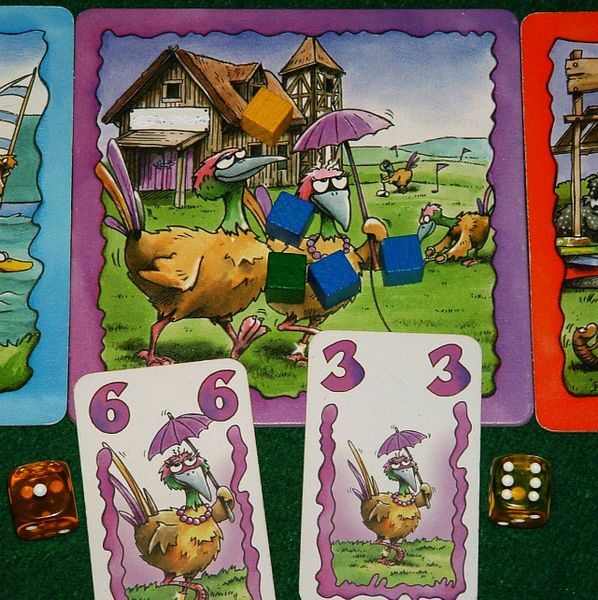 The idea is that there are six farm yards of different colours, if someone plays the only chicken card of a given colour, they get all the grain at that coloured farm. If multiple players go for the same coloured yard, then players can either agree to share the corn in any way that is mutually acceptable or roll the die for all of it. Foxes don’t eat corn, however, they only eat chickens, so if someone plays a fox card, they will eat any chicken cards of that colour. This time there seemed to be a lot of hungry foxes, and lots of fighting birds. These were accompanied by the usual exclamations as people realised that their attempt to grab a pile of corn was stymied by someone else’s decision. It was a close game, with four players within four points of each other. It was tight at the front too with just a handful of points between first and second place, but it was Purple who just edged Green’s father into second place. With that over Family Green headed off and, as Burgundy was still occupied playing San Juan, everyone else felt it was a good opportunity to play Splendor as someone else would have a chance to win. Splendor is a game we’ve played a lot and it is ideal for late in the evening when everyone is tired because it doesn’t need too much thought. Splendor is very simple: players take it in turns to take gems (chips) or use the gems to buy cards from the display. Cards can be used to buy other cards, but some of the cards also give points, and collecting certain combinations of cards allows players to claim a Noble tile giving more points. Essentially, it is a race to fifteen points, though as players finish the round (so everyone gets the same number of turns), it is the player with the most points who wins. This time the game started with everyone evenly matched. There was a lot of overlap in the colours required to claim Nobles tiles, so they were claimed at much the same time. Then Black took the lead and although both Purple and Pine were close to adding to their respective totals, Black’s score of nineteen was unassailable. Learning Outcome: Close Games are Good Games. This entry was posted in Games Night and tagged Azul, Bohnanza, Celestia, Celestia: A Little Help, Celestia: A Little Initiative, Cloud 9, Dixit, Glen More, Glen More II: Chronicles, Hunt the Game Piece, No Thanks!, Orléans, Pick Picknic, Puerto Rico, Reef, San Juan, Splendor, The Gallerist, Tokaido on March 4, 2019 by nannyGOAT. Latin for “dice”, Alea is a brand of Euro games that celebrates their twentieth anniversary this year. Alea is owned by Ravensburger, a company that has been around for nearly a hundred and fifty years producing everything from instruction manuals to children’s books under their familiar Blue Triangle trademark. Alea is a more recent development intended to develop a range of strategy games distinct from their more family-friendly range. Dating from 1999, the Alea range is credited with bringing a lot of “modern classics” to our tables, including Puerto Rico, Ra, Taj Mahal, San Juan, The Castles of Burgundy, Broom Service and one of our groups all time favourites, Las Vegas. There are four series in the range, the “Big”, “Medium”, “Small” and “very Small” box games, each game in the series is numbered with the artwork on the covers designed to have a “book-shelf” look. It looked like the end was nigh when Asmodee bought Heidelberger Spieleverlag in 2017, and with it the distribution rights to the Alea brand. However, Ravensburger reclaimed the rights last year, so to celebrate that and Alea’s twentieth anniversary, they are relaunching the line with new graphics. They are starting with a new version of The Castles of Burgundy, a boxed set including all the current expansions, and Las Vegas Royale, a big-box version of Las Vegas, including selected elements from the Boulevard Expansion and some new action tiles. It remains to be seen how many of the old familiar titles will also get a face-lift and make an appearance in the new line and how many new exciting titles will be introduced. This entry was posted in News and tagged Adel Verpflichtet, Alea Iacta Est, Artus, Augsburg 1520, Bora Bora, Broom Service, Broom Service: The Card Game, Carpe Diem, Castles of Burgundy, Chinatown, Die Sieben Weisen, Edel, Fifth Avenue, Glen More, In the Year of the Dragon, Las Isla, Las Vegas, Las Vegas Boulevard, Las Vegas Royale, Las Vegas: The Card Game, Louis XIV, Macao, Mammoth Hunters, Notre Dame, Palazzo, Puerto Rico, Ra, Royal Turf, Rum & Pirates, Saint Malo, San Juan, Stein & Reich, Taj Mahal, The Castles of Burgundy: The Card Game, The Princes of Florence, The Traders of Genoa, Witch's Brew, Wyatt Earp on February 21, 2019 by nannyGOAT. With the Festive Season now apparently upon us, the pub was once again packed and food was later than usual. For this reason, we started with a quick game of No Thanks!. This used to be one of our “go-to” filler games, but has been somewhat neglected of late, so was surprisingly unfamiliar to some people. It is very simple though and very easy to learn on the fly: everyone starts with eleven red chips and the first player turns over the top card—they can take it, or pay a chip for the privilege of passing the problem on to the next player. The player with the lowest summed card total when the deck expires is the winner. There are are two catches, firstly, where a player has a run of consecutive cards only the lowest is counted and secondly, a small number of cards are removed from the deck at random. Top scorer looked to be a toss up between Blue, Red and Mulberry, but Red took the dubious honour in the end, with forty. It was tight between Pine and Burgundy, however, both of whom had a large pile of chips and a substantial run of high cards (between them they had nearly forty of the fifty-five chips and the cards numbered twenty-eight to thirty-five). There were only two points in it in the end and it was Pine who took the honours. The group had been just about to start playing when Black, Purple and Green had walked in. Since No Thanks! only plays five, so pre-empting a discussion of options, Blue chucked over a copy of Dodekka which the group obligingly settled down to play. This is another light set collecting game where the aim is to get the highest score possible from one of the five colour suits, while ideally scoring nothing in all the other suits. Gameplay is very simple: take the first card on display, or reveal a card from the deck and add it to the end of the row (thus “passing”). If the sum of the cards on display now totals more than twelve, the active player must pick up all of the cards on display. When the deck runs out, the winner is the player with the highest score (the total face value of one suit minus one for each other card). It was very close at the top, with only one point separating Black and Purple, and much to Purple’s chagrin, it was Black who came out on top. Just as No Thanks! was coming to an end, food arrived, along with Ivory. Dodekka was still going, so while some munched, those remaining decided to give The Game an outing (played with a copy of The Game: Extreme, but ignoring the special symbols). This is a surprisingly popular game within the group, which is remarkable because it is cooperative and we generally prefer competitive games. Another simple game, the idea is that the team have a deck of cards from two to ninety-nine and they must play each card on one of four piles: two where the card played must be higher than the top card, and two where it must be lower. There are just three rules: on their turn, the active player can play as many cards as they like (obeying the rules of the four piles), but must play at least two cards before replenishing their hand, and players can say anything they like but must not share “specific number information”. Finally, there is the so-called “Backwards Rule” where players can reverse a deck as long as the card they play is exactly ten above or below the previous card played on that pile. Red started and it quickly began to go wrong with with Pine holding a “nice mid-range hand”. With the help of everyone else he battled through though, and it wasn’t long before he had a “nice extreme hand” while all the piles were offering “nice mid-range options”. It perhaps wasn’t surprising with this that the group didn’t win (i.e. play all their cards onto the four decks), but given that they had such a poor run of luck, they did well to exhaust the draw deck and ultimately have only eight cards they were unable to play. Inevitably, Dodekka finished just after The Game started, so Black, Purple and Green killed time with a quick game of Love Letter. This is the original “micro game”, consisting of just sixteen cards. The idea is that each player starts with a single card, draws a second card and chooses one of the pair to play. The cards are numbered one to eight (with more of the lower numbers), and each number has an action associated with it. The aim is to eliminate all opponents, as the last man standing is the winner. Rounds only take a minute or two, so elimination is not a problem. This time, each player won a round. So with honours even and with the other game and food coming to an end, it was sudden death. This time it was Purple’s turn to come up trumps, taking the final hand and with it, the game. This started a big debate as to who was going to play what. 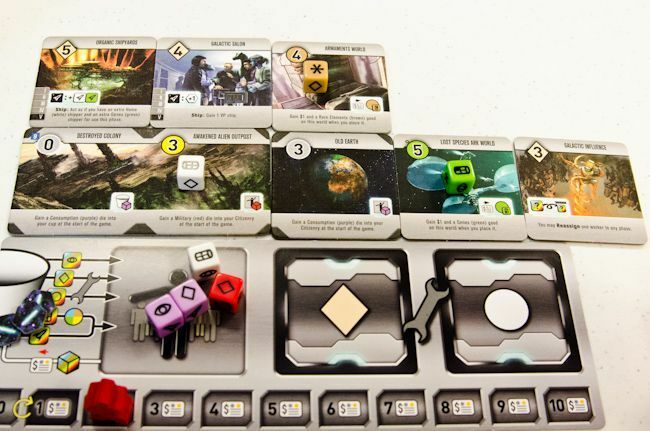 As it was likely to be Ivory’s last chance for a meaty game for a few weeks (with Christmas and his impending arrival), the “Feature Game” was Ambition, the expansion to one of his favourite games, Roll for the Galaxy. With Burgundy fed-up with the feeling of confusion that Roll for the Galaxy always gave him and Black feeling that he’d played it a couple of times recently, for a while it looked like it was only going to be Blue and Ivory. Eventually Black saw sense, and Green joined in, despite the fact that he felt he’d not played the base game enough to appreciate the expansion. Roll for the Galaxy is the dice game of the popular empire building card game, Race for the Galaxy. Both suffer from the same “iconography confusion”, but that aside, neither are actually complicated games. The idea builds on the Puerto Rico/San Juan idea of different phases or activities that only happen if or when players want them to. Roll for the Galaxy is almost a “worker placement” game where dice are the workers and have a say in what sort of work they do with players “spending” these dice to make actions happen. Each player starts with a dice in their cup which they roll and assign, in secret behind a screen. When dice are used they are placed into the player’s Citizenry and it costs a dollar to move them from the citizenry to back into the cup. Each face of the worker dice corresponds to one of the five different action phases: Explore, Develop, Settle, Produce, Ship. Each player uses one die, any die, to select a single phase that they want to “happen”. All the other dice are assigned to the Phase that corresponds to the face rolled. Any that do not correspond to the chosen phase can only be used if another player chooses those phases to happen. Any that are used move into the player’s Citizenry, any that are not used go back into the cup. As such everyone is reliant on other players to help them out and the player who best piggy-backs other players’ choices usually does well. It is not only about second-guessing what other players are going to do though: success also requires a good strategy, a complementary tiles (Worlds), an understanding of probability, the ability to effectively manipulate the dice rolled, and a modicum of luck. Luck is everywhere, but there are ways to mitigate its effect. For example, in Phase I (“Explore”), players draw tiles out of a bag. These are double-sided with one side being a Development World and the other a Production World. These are “Built” in Phases II & III (“Develop” and “Settle”) and the cost is paid in dice, anything from one to six (with expensive Development Worlds generally partnered with cheap Production Worlds). These tiles are drawn at random in Phase I and a side chosen and the Worlds added to the bottom of their personal Development or Settle pile as appropriate. The top World tile is the one that will be built first and if there is not enough to complete a building, that means there will be fewer dice available for the following rounds, until it is finished. This may seem very harsh, with players potentially getting stuck with a high value building and a shortage of dice so that they struggle to complete it in a timely fashion. However, clever use of the Explore Phase can ensure that this is not a problem, despite the luck involved. Players can discard as many tiles as they like, drawing one extra from the bag. Thus, an early round committing lots of dice to the Explore phase can enable lots of tiles to be recycled as better ones are drawn. Dice assigned to Phase IV (Produce) are moved to Production Worlds where they will stay until Phase V (ship) happens and that player has dice assigned to it. In this way, dice can get “stuck” in a similar fashion to dice involved in Developing or Settling. Thus dice management is one of the key skills to the game. Points come from building (a building that requires five dice is generally worth five points at the end of the game); from bonus points Development buildings which give points for some particular feature (e.g. one extra point for a particular type of Production World), and from victory points generated during Phase V (Shipping) by using the “Consume” option. The Ambition expansion doesn’t change the game very much, simply adding a very small number of Worlds, some extra Starting Worlds, some in game Objective tiles and replaces one of each player’s starting white dice with a black “Leader” die. 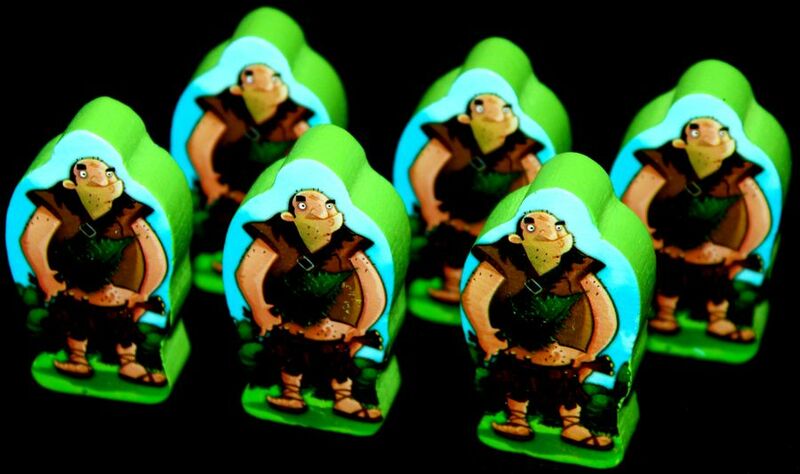 The first player (and only the first player) to achieve each of the objectives receives “Talent” counters; these can be treated as single-use workers or as victory points at the end of the game. 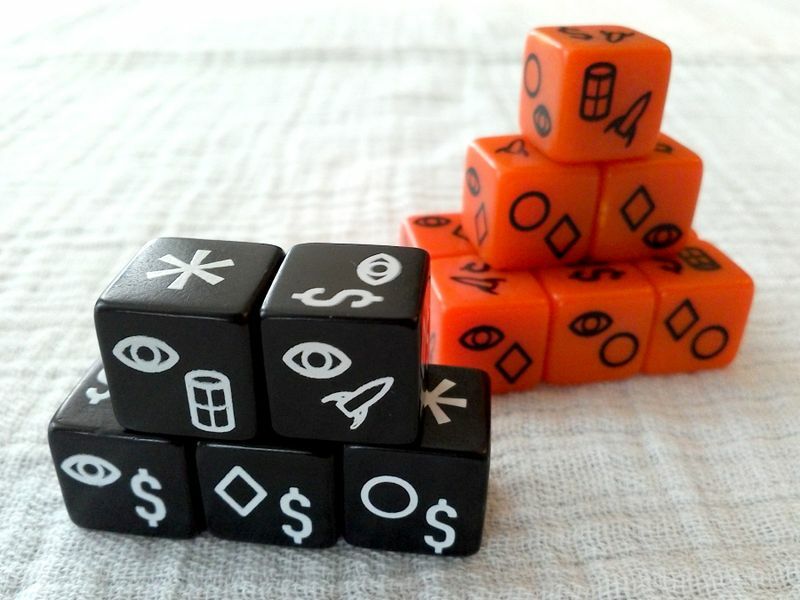 There are also orange “Entrepreneur” dice—these and the “Leader” dice have some faces with two symbols allowing players to choose which of these Phases to assign them to and giving them the magic power of automatically switching to the alternative Phase if the initial nomination does not happen. There are a couple of other little twists, for example on some faces the second symbol is a dollar sign signifying that if the die is used for its intended Phase then the die goes back into the Cup (not into the Citizenry) after use, making it effectively free to use. Ivory was fastest out of the blocks with a large amount of liquidity from his “Doomed World” that gave him $8 start up. Furthermore, his “Alien Artefact Hunters” start-world gave him $2 each time he consumed Alien goods, and Victory points (from Consuming). For everyone else it looked like it was going to be over before it had begun when Ivory was the first to achieve an Objective, adding the associated Talents to his already growing pile of victory points. Although they were a little less obvious , everyone else’s Start Worlds were quite useful too however. Black for example received extra cash every time he developed, Green had the ability to reassign two of his white dice as Explorers or Settlers and Blue could reassign any two dice to explore. These special abilities were slower to take effect, but gradually, these, together with the lack of production on the “Doomed World” meant the group began to haul back Ivory’s rapid head-start. Blue, and to a lesser extent Green, spent a lot of time Exploring (using their special abilities), carefully choosing which Worlds to build and stacking the deck to control the order, a tactic that paid dividends later in the game. In Blue’s case, she used the Objectives as a target and then used the Talents to finish off Worlds quickly enabling her to grab a couple from under Ivory’s nose. Green more or less ignored the Objectives as he was too busy trying to remember how to play the base game while fiddling with his phone. Black was less fortunate, and really struggled with the luck of the dice and found it difficult to make use of his special ability to get his engine going. Then suddenly it looked like Ivory might end the game as the Victory Point reserve rapidly depleted. He couldn’t make it on the first attempt though and there were a couple more things he wanted to do in any case. In the end it was Blue who ended it—building not only her twelfth World, but also an extra one giving her a massive forty points for that alone. Although Blue had a couple of Victory Point chips and a handful of Talents left over, it paled into insignificance compared with the massive pile of chips in front of Ivory—the question was whether it would be enough though. It was very close, but Blue’s last round just tipped it in her favour and she won by five points. With that, Ivory and Green took their leave, leaving Black and Blue to consider their options. While they had been playing with their dice, the others had played a full four rounds of Saboteur and moved on to their next game. 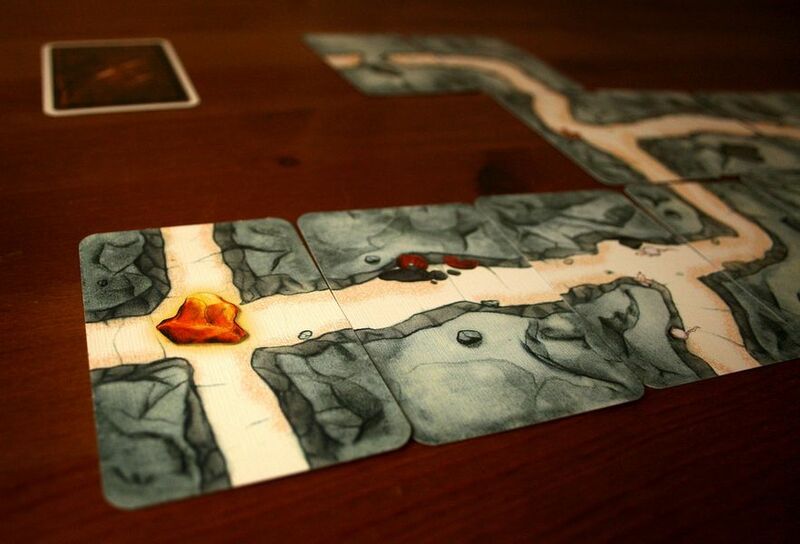 Saboteur is a fun little hidden traitor game where players are either Dwarves trying to find the treasure or Saboteurs trying to stop them. We’ve played it quite a bit and in truth it plays best with more than six players, as the number of Saboteurs varies and there is an element of doubt. With five their can be either one or two Saboteurs, and the odds are heavily stacked against a lone Saboteur, but in favour of a pair. Nevertheless, the group were keen to introduce Mulberry to it. It is another quite simple game: On their turn, players can play a tunnel card onto the grid in the centre, play a special card (a broken or fixed tools card on another player or a map card to look at the destination cards), or discard a card face down and then draw a replacement. If the Dwarves don’t get to the treasure before the cards run out, the Saboteurs win. In the first round, Burgundy was isolated as the Saboteur and despite his best efforts, he failed to disrupt an organised team of Dwarves. In the second round Burgundy was joined by Pine, and with two of them the odds were much better and the pair took the opportunity to prevent the Dwarf team from getting to the gold. As a group, we normally only play a couple of rounds, but everyone wanted to see if luck would deal Burgundy a Dwarf card. The immediate answer was no, and in the end it turned out that the third rounds was a direct replay of the second with Pine joining Burgundy on the Saboteur winning team. By this time the group had decided they would keep playing until Burgundy wasn’t the Saboteur, and in the fourth round they finally got their way when Mulberry was a lone Saboteur. Inevitably she failed to break the will of the “gang of four” who easily found the treasure. Normally we don’t bother sharing out the “gold” scoring cards as it is very arbitrary who goes first and in a low number of rounds it is purely luck who wins overall which takes some of the fun out of the game. This time though, the group played the rules as written. With Burgundy and Pine winning two rounds and sharing the spoils two ways (instead of three) it was inevitable that they would score well. In the end it was Pine who did lightly better, thanks to the fact he had been on the winning Dwarf team in the first round. As Roll for the Galaxy was still going (and Red and Mulberry had gone home for an early night), the group looked round for something else to play and Purple’s beady eye lit on Steam Donkey. Steam Donkey is a card game that involves building a seaside resort consisting of a four by three grid of attraction cards. The three rows represent the different parts of the resort: beach (yellow), town (pink) and park (green). Similarly, the four columns correspond to the different types of building: amusements, lodgings, monuments and transport. 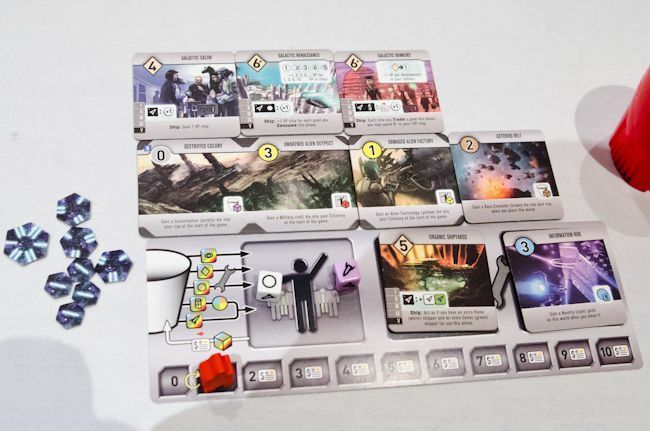 In order to place a feature, it must go in the correct location and must be paid for using cards of the same type, as such it has similarities with games like Race for the Galaxy and San Juan. As players build their resort, visitors arrive at the station and come to see the attractions. Each attraction can take a certain number of visitors, which are actually a row of face down cards that are used to replenish the cards in players’ hands. Thus, on their turn players carry out one of the following actions: choose a colour and build as many attractions in that colour as they can/want paying with other cards from their hand; choose a colour and start taking cards in that colour from the “station” (a row of face down cards), or if there are no visitors of the chosen colour (or there are no spaces for the visitors to go), they can add visitor cards to their hand and refill the station platform with four new visitors. The colour of the visitor side of cards does not reflect the colour of the attraction on the other side, however, the type of attraction is indicated. There is a hand limit of twelve though and this can actually be quite a serious impediment for players collecting cards to build the more valuable attractions. At the end of the game, points are scored for each unique attraction built as well as for fulfilling individual goals and bonuses depicted on players’ resort posters. It was a long time since anyone in the group had played it, and Pine hadn’t played it at all, so it took a while to get going. It was close at the top with Burgundy and Pine scoring pretty evenly for their buildings and taking almost exactly the same number of bonus points too. Burgundy just had the edge however, and took the game by three points, with a grand total of seventy. When Roll for the Galaxy finally finished and Green and Ivory left Blue and Black alone it was clear that they were going to be waiting for a while, so they looked round for something that wasn’t too long and played well with two. In the end, they settled on Kingdomino, but decided to add the new Age of Giants expansion acquired at Essen. Kingdomino is a tile-laying game with a couple of clever mechanics. Players take it in turns to choose a “domino” and add it to their “Kingdom”. The clever part of the game is that the tiles are numbered with players who choose the high numbered (and therefore more valuable) dominoes taking their turns later in the next round. In the two player game, players get two turns per round, so their first turn can be used to try to set up the second turn. In the two-player game, each player is building kingdoms consisting of 7×7 arrays of “squares” rather than 5×5 arrays, which makes the game much more strategic. The game ends when there are no more tiles to place. Scoring is by multiplying the number of tiles in each terrain by the number of crowns in that terrain. Thus a moderate sized area with plenty of crowns is worth more than a large area with very few crowns. The Age of Giants expansion doesn’t change things as much as Queendomino, which we found managed to take all the fun out of the game and add a whole load of unnecessary complexity instead. This expansion adds a small number of tiles that feature either a Giant or a Giant’s footprints. When a Giant Tile is drawn, a large wooden giant meeple is placed on it. When this is taken, the Giant is taken too and is placed over one of the crowns anywhere on that player’s area. When a footprints tile is taken, a Giant of their choice moves from their Kingdom to another player’s Kingdom. There are two problems with this little addition, firstly, there is a rules tweak that means five tiles are drawn in the two player game and one is discarded. Blue and Black found that this meant they just chose not to take tiles with Giants on them except when forced to right at the end. Secondly, even when forced to take a Giant, there was almost always somewhere it could be poked that caused minimal damage, so it wasn’t really a big issue. This was a real shame as the Giants are lovely. As well as adding a fifth player there is also a a small pile of bonus-point tiles; both Blue and Black really liked these as they thought that they added a nice twist. This time, they ended up with bonus points for Sea tiles adjacent to the castle and Marsh land on the corners. Both players tried to accommodate these, though Black did a much better job than Blue. It may have been that Black was focussing too much on the bonuses however, as he ended up unable to place all his tiles. And although he scored well on the bonuses and for Sea and Pasture, he scored very little for Woodland, Marshland and Mountains. In contrast, while Blue completely failed to score for Pasture, she scored well in every other terrain and made a killing with her Wheat fields, giving her a total of two-hundred and thirty-three, some sixty more than Black. With that done and the epic game of Steam Donkey finally over, there was just time to arrange some of the details for the Christmas Party nest time before everyone went home. Learning Outcome: We like simple games: they can be quick to learn, but take time to master. This entry was posted in Games Night and tagged Dodekka, Kingdomino, Kingdomino: Age of Giants, Love Letter, No Thanks!, Puerto Rico, Queendomino, Race for the Galaxy, Roll for the Galaxy, Roll for the Galaxy: Ambition, Saboteur, San Juan, Steam Donkey, The Game, The Game: Extreme on December 10, 2018 by nannyGOAT. Blue was late after an unscheduled nap, so Burgundy consumed the first half of his supper alone. Blue was quickly followed by Ivory and Pine and then a new visitor, Navy. With Cobalt last week (who was busy moving house this week so couldn’t come) that makes two new people in two weeks. Navy is a more experienced gamer and is into slightly more confrontational games than those we normally play, but that’s good as it might encourage us to leave our comfort-zone of cuddly Euros set in medieval Germany. As we were all introducing ourselves, Green, and then Black and Purple turned up and the discussion moved on to how we choose the “Feature Game” (Blue suggests something to Green who mostly replies that he’s never heard of it, but it sounds quite interesting…). 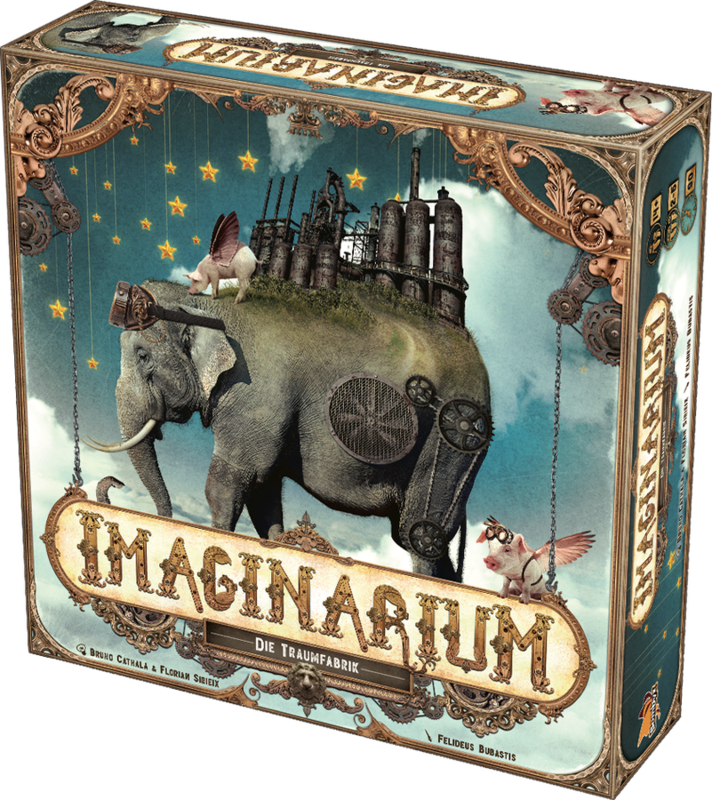 Recent discussions have centred round the new Key Flow (aka “Keyflower the card Game”) for the next meeting and maybe Imaginarium (or, “The One With The Elephant on the Front” as Navy referred to it). With that, Green started getting out this week’s “Feature Game“, which was Greed, a card drafting game where players are crime lords trying to earn more money than anyone else through clever use of their cards. At it’s heart, Greed is a quite simple, card-drafting game with a healthy dose of “take that” and a gangster theme. Players start with a hand of twelve cards and “draft” three cards (i.e. choose a cards and pass the rest on, three times). Players then simultaneously choose one card then together reveal this card and action it before the it is replaced with another drafted card. A total of ten cards are played in this way per person before the players tally their holdings and the player with the highest value is the winner. Obviously, the game is all about the cards and there are three types, Thugs, Holdings and Actions, but it is the combination of these that is critical. Actions have a unique effect associated with them while Thugs and Holdings typically also have a cost or a condition associated with them (e.g. cash paid to the bank or a collection of symbols on cards held). Holdings are the key however. 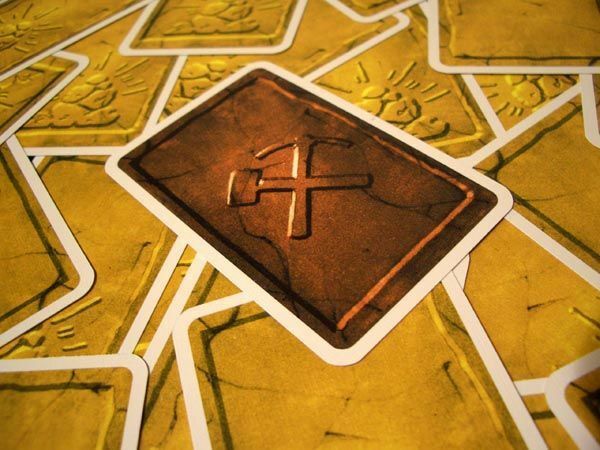 When a Holding is played a token is placed on that card for each symbol on it and an additional token for each symbol of that type already possessed. These tokens are worth $10,000 each at the end of the game which is added to the value of cash collected through card plays. Although it was Green’s game he had only played it once and that was over a year ago, while Burgundy had read up on it. Pine and Navy had joined them to make the foursome. The game takes a few rounds to understand how it really works. After that, it’s quite easy to play, but working out which card to take and which to play is much harder, as they all seem to be really good. Unfortunately Navy struggled a bit at the beginning and made mistakes in his first couple of plays as he either found he couldn’t actually play his chosen card and had to just ditch it, or wasn’t able to get the indicated bonus. However, as he had not accumulated any wealth early on, it also meant he didn’t lose any when Green played a couple of cards which meant everyone else lost dollars, which leveled the scores a little. Burgundy’s preparation really helped when he played a Holding card and proceeded to place six tokens on it, so by the half way mark it was looking like a two horse race between Burgundy and Green with both Navy and Pine looking short on cards. Through the second half of the game, Pine really got the hang of it and started raking in the dollars and had quite a pile of cash. Green then played a Holding card which enabled him to add chits equaling the same number as the maximum on another players cards, which meant he was able to gain from Burgundy’s excellent earlier play. In the final rounds, Green played another card which removed one of his holdings only to be able to play it again the following round with even more tokens than it had previously. There was a brief discussion as to whether he should get the usual amount for it as well as the removed ones and two extras, a decision that went in Green’s favour, but the real question was whether it would be enough to beat Burgundy. In the end, it was close, but the answer was no and Green finished with $30,000 behind Burgundy’s winning total of $235,000. Meanwhile, on the next table everyone was being indecisive, but in the end the decision was made in favour of Roll for the Galaxy. This is a game that really fascinated the group for a while because somehow it behaves differently to everything else we play and we really struggled to get to grips with it. At the time, we concluded that our struggles were probably because we weren’t playing it enough so effectively had to learn it afresh every time we played. For this reason we went through a phase of playing it quite a bit, but that was some months ago now and it was definitely time for another outing. In principle, it is not a difficult game and the core mechanism is similar to the so-called “deck builders” (like Dominion) or “bag builders” (like Orléans or Altiplano), except instead of building a deck of cards or a bag of action tokens, players are building their supply of dice. 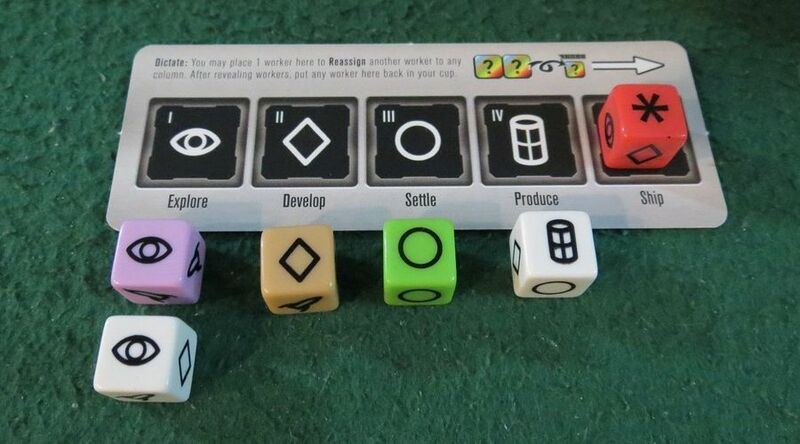 In Roll for the Galaxy, each different die colour reflects the different distributions of the dice, so for example, white “Home” dice feature each of the symbols for Develop, Settle, Produce and Ship once and Explore twice. 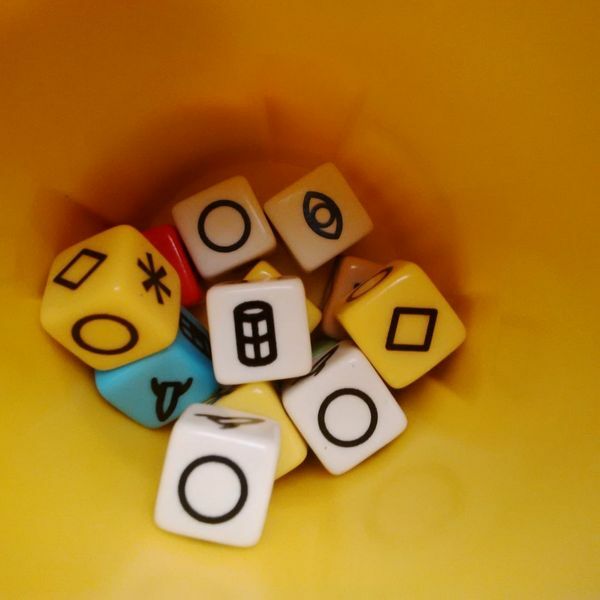 On the other hand, the yellow “Alien Technology” dice have three faces that depict the asterisk (“Wild”) and one each of Develop, Settle and Produce. 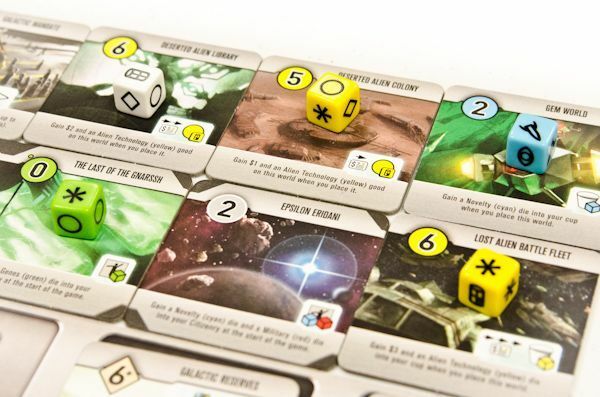 Thus, where probability affects which cards or tokens are drawn in the other games, in Roll for the Galaxy, players have more control over which dice they are using, but chance affects how those dice roll. In principle, Roll for the Galaxy is not a difficult game and the basic mechanism is similar to that in Dominion or Orléans/Altiplano, except instead of building a deck or a bag of action tokens, players are building their supply of dice. 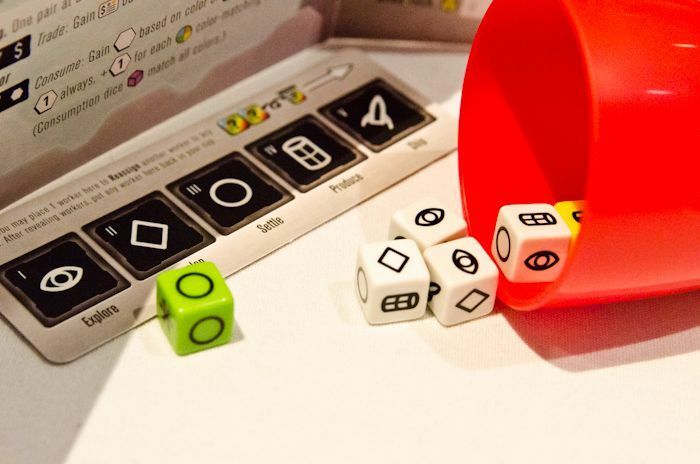 Each different die colour reflects the different distributions of the dice, so for example, white “Home” dice feature each of the symbols for Develop, Settle, Produce and Ship once and Explore twice. 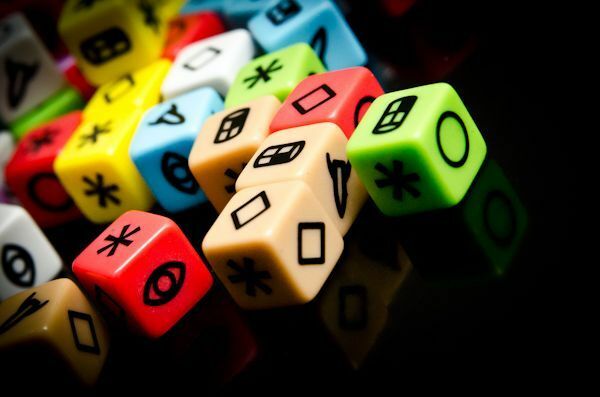 On the other hand, the yellow “Alien Technology” dice have three faces that depict the asterisk (“Wild”) and one each of Develop, Settle and Produce. 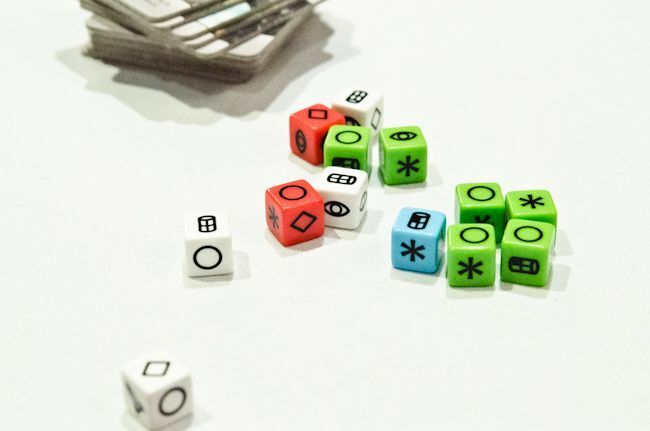 Thus, where probability affects which cards or tokens are drawn in the other games, in Roll for the Galaxy, players have more control over which dice they are using, but chance affects how those dice roll. Although the dice are important, like Greed, the game is really all about the special powers the players’ tableau, in this case made up of World tiles rather than cards. Ultimately the game is really a race to trigger the end of the game is when the victory point chip pool runs out or a player builds their twelfth World. Game play is mostly simultaneous: players roll their dice and allocate them to their phase strip. Each player can choose one phase that they guarantee will happen, so in a four player game there is a maximum of four phases per round and where players choose the same phase there will be fewer, sometimes even only one. The phases are: Explore, Develop, Settle, Produce & Ship which correspond to draw Worlds from a bag; “spend” dice to build development Worlds; “spend” dice to build production Worlds; place dice on production Worlds, and move dice from production Worlds in exchange for either victory points or money (which in turn can be used to speed up recycling of dice). While we were setting up Ivory regaled us with the first few pages of Julia Donaldson’s “The Gruffalo”. We will miss him and his stories when he takes his paternity leave in the new year. Blue began with the poor starting combination of a level six development World and a level one settlement, or a a level one development World and a level six settlement so began by rectifying the problem by exploring. The game rocked along at a merry lick, with Black and Purple building and Ivory thrilled that he finally managed to build his first ever “Alien Technology World”, a feat he quickly followed with his second. Blue was slower building, but had a few high value developments and made good use of these before she began collecting some victory points. This started a sudden cascade of Black and Ivory collecting points as well. As a result, everyone focused on the number of victory point chips as the end game trigger, so much so that nobody, spotted that Purple had built her twelfth World. As the group was just about to start the next round and everyone likes seeing their plans fulfilled, they played on anyhow. Although it was a very tight game and everyone added to their scores, the extra round probably didn’t make any difference to the final placings. Black and Ivory took over twenty victory points in chips alone, but they were offset by Blue’s high value Worlds and bonus points which gave her fifty-six points, just three more than Black in second place. Everyone enjoyed the game, but there was one non-game highlight: Green’s sad little face when he looked across and broke off from setting up Greed with the sad comment, “Oh, They’re playing Roll for the Galaxy…” Well, as everyone had a good time and with players getting quicker at it, it’s less of a labour than it used to be, so it surely won’t be long before he gets a chance to play it again. Greed finished first and as it was still early there time for another game, but nobody wanted to have a late night so the group picked something shorter and settled on this year’s Spiel des Jahres winner, Azul. This was another game that was new to Navy, but it is very popular in the group and we’ve played it a lot. Players are tiling a wall, taking tiles of one colour either from one of the factories (putting the rest in the central pool) or from the central pool. Tiles are added to rows on the players’ boards and at the end of the round one tile from each full row is transferred to the players’ mosaics. The aim is obviously to fill all the rows to transfer the maximum number of tiles, however, any excess tiles score negative points. Navy quickly got the hang of this one and all the scores were close for a lot of the game, though it was noted how neat Green’s mosaic was looking as he managed to fill the first left hand vertical row and nearly completed the second as well before placing anywhere else. Burgundy and Pine were both less tidy, but was still picking up extra points for connecting tiles when placing them. Although Navy’s board was a little more scattered, but that would help him to catch up later. Everyone thought they were entering what would be the final final round with three players with at least one row just one tile from completion, amazingly nobody completed them and everyone get one extra round. This meant the group actually ran out of tiles to place on the central discs, triggering the end game in different way. After this final round and final scoring, Pine finished on top of the podium, ahead of Burgundy in second place with Navy in a very respectable third in a close game. While Roll for the Galaxy was finished, there was a bit of chit-chat about strategy and it was clear that to do well at the game, you also need to keep a close eye on what everyone else is doing too. This can be tricky when you are struggling to work out what to do on your own board however. 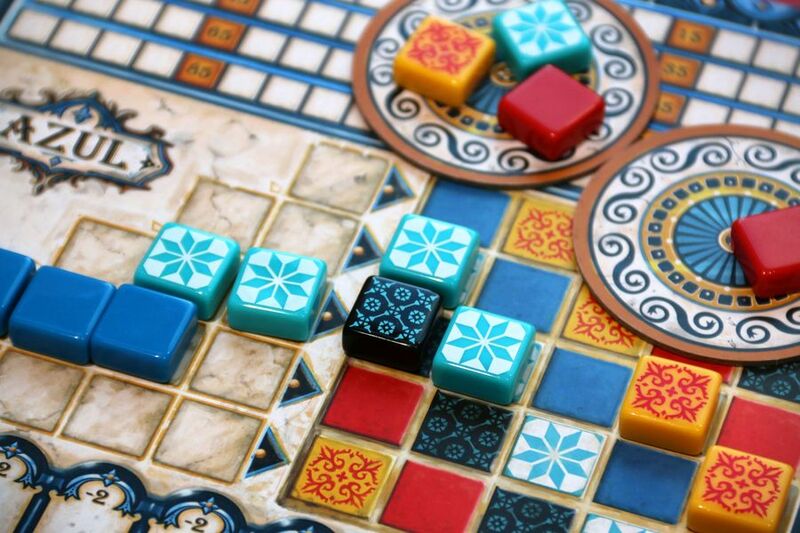 Winning or losing though, Azul is a nice game that always delivers a challenge; it will be interesting to see how the new stand-alone version of the game, Stained Glass of Sintra compares and if it is as good or better than the original, or whether it “does a Queendomino or Tsuro of the Seas“. No doubt we will find out in due course. With that, those that wanted an early night headed for home, leaving Black, Purple, Burgundy and Blue with time for one last, shortish game. Black suggested San Juan which had been played at the last Didcot Games Club meeting, and everyone else concurred. 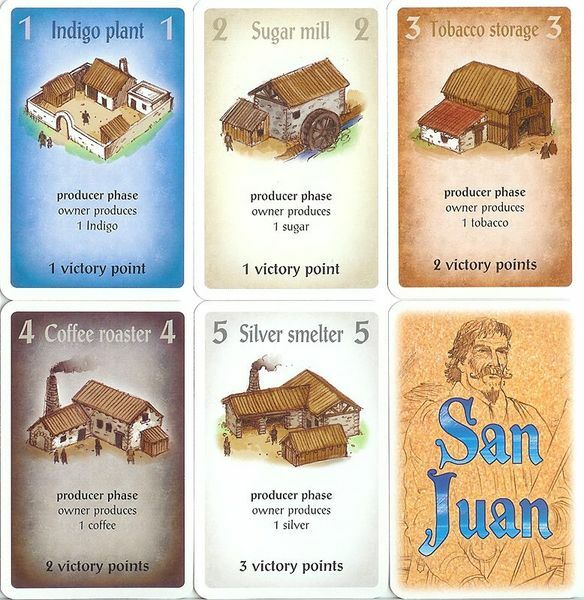 Essentially, San Juan is sometimes referred to as “Puerto Rico the Card Game”, but in truth they are very different games although the artwork and roll selection is similar. In practice, it is actually a simpler version of the card version of Roll for the Galaxy, Race for the Galaxy. The game uses the same multi-purpose card mechanism seen in games like Bohnanza, though in this case, cards can be buildings, goods, or money. The idea is that players take it in turns to choose a “role” and then everyone carries out the action associated with that role, though person who chose it carries out with the “privilege”, a slight advantage. The roles are Councillor; Prospector; Builder, Producer and Trader. Players have a hand of cards and can use the Builder to build these cards to paying for them with other cards from their hand. Hands are replenished directly using the Councillor or Prospector. However, it is much more efficient to build an engine using production buildings. These take cards from the deck and turns them into goods when a player chooses the Producer role; when the Trader role is chosen, these goods can be traded for cards according to the current value depicted on the tally stick. The game end is triggered when someone builds their twelfth building. Black and Burgundy were quick out of the traps building their efficient production engine, with high value coffee and silver producers. Purple started with “purple buildings” before also moving into sugar production and then Monuments. Blue on the other hand started with a hand full of nice looking purple civic buildings that she didn’t want to part with and after three rounds hadn’t seen a production building, so decided to try something different and built a Tower (to increase her hand limit from seven to twelve) and started building. Elsewhere on the table Burgundy was stealing a march on everyone else, adding a Well, Smithy, Aqueduct and Market Hall to his high value buildings. When he added a Library which enabled him to use his privilege twice, he began turning over cards at a phenomenal rate and it looked like the writing was on the wall. Everyone was keeping a careful eye on everyone else, trying to make sure they didn’t fall behind in the number of buildings they had, and before long, the game end was triggered and it was the final round then the scores were added up. After the scores had been added up, Black bemoaned the lack of the endgame scoring bonus cards that rewarded the production buildings and monuments that he had been collecting (Guild Hall and Triumphal Arch). It was then that Blue explained that she had been stashing them under her Chapel as she had no use for them and didn’t want the others to have them. It was possible that this tactic made the difference, as despite having only two production buildings, her City Hall and Chapel delivered a massive thirteen bonus points, just enough to offset the cheaper buildings she had been forced to build. Remarkably, Blue finished with thirty-one points, four ahead of the “Production King” Burgundy. Learning Outcome: Though difficult, it is important to keep a close eye on what everyone else is doing. This entry was posted in Games Night and tagged Altiplano, Azul, Bohnanza, Dominion, Greed, Imaginarium, Key Flow, Keyflower, Orléans, Puerto Rico, Queendomino, Race for the Galaxy, Roll for the Galaxy, San Juan, The Grizzled, Tsuro of the Seas on October 30, 2018 by nannyGOAT. With Burgundy and Blue waiting for food, they decided to entertain Red with a quick game of NMBR 9, making it’s appearance at four consecutive games nights and starting three, something of a record. Somehow despite this extended run, Red had managed to avoid playing it, so after a very quick run-down of the rules, we started. The game is really very simple indeed, with players simultaneously drawing tiles and adding them to their tableau. Tiles can be placed on top of other layers as long as they don’t overhang and overlap more than one tile. Each tile depicts a number and the more tiles it sits on, the more points it scores. The whole game is typically over in about ten to fifteen minutes, and in this case it was quite tight between Blue and Burgundy, though Blue finished on ahead thanks to a lot of high-scoring tiles on her third level. Although it has proved to be a highly popular filler thanks to it’s simplicity and minimal set up time, Red was not so impressed because she felt it had seemed to offer more when she had watched everyone else playing. She struggled to explain what she meant, but it was clear that she was a little disappointed though that was probably largely due to her expectations. By this time, food had been dealt with and everyone else was arriving, and as the “Feature Game” was to be be Mini Park, another quick filler, we got on with deciding who would play it. When Ivory’s comment, “I’ll play that, but it depends on what else is on offer really…” was challenged, he added, “Well, if the alternative is Kingdomino, I’d rather try Mini Park!” Since Black had chosen that moment to wave Kingdomino around, that pretty much settled them as the two games and uncharacteristically, almost everyone jumped on the Mini Park band-waggon, leaving Black and Purple to play Kingdomino alone. The group doesn’t usually go for two-player games and as Black and Purple get lots of opportunity to play games like this together, normally someone would join them. However, in this case, both games were short and Kingdomino can be a bit variable with three due to the tiles that are left out, so we just got on with it. Kingdomino was the Spiel des Jahres in 2017 and has been very popular within the group as a light filler, so has hit the table quite a bit in the last year. The game is quite simple in that players take it in turns to choose a “domino” and add it to their “Kingdom”. The clever part of the game is that the tiles are numbered with players who choose the high numbered (and therefore more valuable) dominoes taking their turns later in the next round. In the two player game, players get two turns per round, so their first turn can be used to try to set up the second turn. Unfortunately, Black and Purple forgot about the other key difference when playing a two player game: instead of 5×5 arrays, each player is building kingdoms consisting of 7×7 arrays of “squares”. They suddenly noticed they had more tiles left than they had spaces and realised their error, so decided to carry on playing anyhow. Purple concentrated on getting corn fields and then sea and finally forests, while Black just tried to build areas of everything and make sure he was able to place all his tiles. It was very, very close, but despite the fact that she had to forfeit some tiles and failed to pick up her bonus for completing her grid, Purple just pinched it by a single point. Meanwhile, on the neighbouring table, everyone else was learning the “Feature Game”, Mini Park, another quick-playing, tile-laying game. On the face of it, this has a lot in common with Carcassonne, played with two face up tiles to choose from. 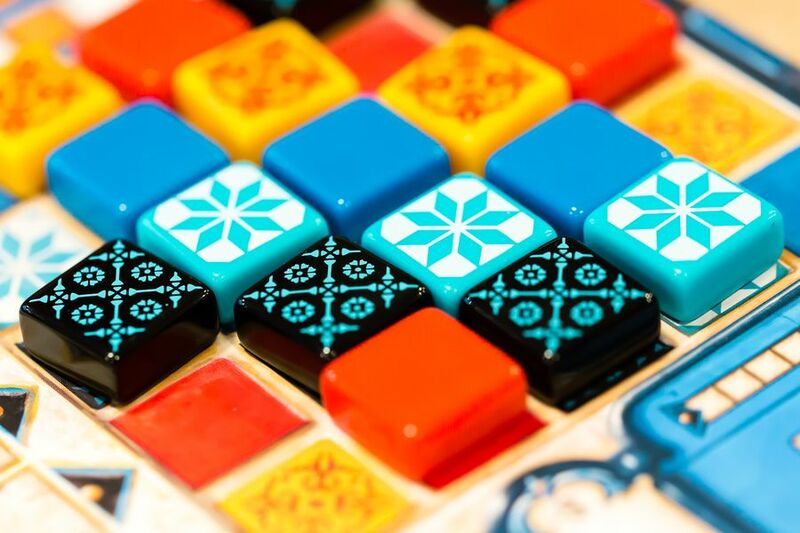 In contrast, however, the tiles are hexagonal which gives a little more variability and once during the game, players choose one character which dictates the end game scoring. We played the “advanced” game which has slight changes to the scoring and pairs each scoring character at random with a second character. In our game, for example, the Black Man in the Smart Hat was paired with the Yellow Fish, so the player who chose the Man (Ivory), got half the points that the player who chose the Fish got for that character (Blue). It was felt that this would add an interesting dynamic to the game as it would take on some aspects of a semi-cooperative game. Unfortunately, nobody realised at the start just how powerful (or not) each of the characters were and in that game it turned out that some were really very powerful indeed. For example, at the start of the game everyone was encouraged to place fish next to other fish, as this was the only way to make them pay when they were being placed. However, this left a large fish pond with lots of fish and when Blue (who was the first to get to the Yellow Fish Marker) and then Ivory added to it, it yielded a massive twenty-four points. Although this was the most lucrative character, the Green Man on a Bicycle (claimed by Pine) was not far behind with eighteen points. This was thanks largely to the fact that Pine and Blue (who had the Bicycle as her subsidiary character) kept drawing road tiles and extending the road the Bicycle was on, trying to scupper Ivory’s plans to build roads with benches. Although Burgundy picked up the most points for tile placement, the majority of the points come at the end of the game and, as he was last to pick his character, Burgundy was penalised when he ended up with the relatively low scoring White Bird (ironically partnered with the Orange Cat that also failed to score highly). Pine scored well for his Green Cyclist, but did not pick up enough subsidiary points from the White Bird. Ivory’s subsidiary scored highly (Yellow Fish), but much to his chagrin the scoring for his Black Man in a Smart Hat was severely restricted by Pine and Blue’s tactics. Blue, however, did well on both her primary goal (Yellow Fish) and her subsidiary (Green Cyclist), giving her more than enough compensate for a poor score on the tile placement, and she finished some way in front. If everyone had realised the implications of how the scoring worked, it was quite likely that they would have played differently and it would not have been such a landslide, and chatting afterwards, it was obvious that that aspect coloured people’s opinion of the game. The fact that everyone had only one shot at a character was meant it felt that all a player’s eggs were in one basket. This was made worse by the fact that with only one shot, the challenge was when to choose a character: too early and everyone else would be able to obstruct, too late and only the dross is left with not enough time to improve the situation. That said, it was not a long game and with only three players it would be very different as each player gets two opportunities to take character cards. Furthermore, it seems the rules are still being developed, for example, the latest version of the online rules state that the subsidiary character cards are placed face down and thus kept secret until the end of the game and the tile placement scoring has been simplified too. Given that it is such a short game, we should certainly give this one another go sometime, perhaps with the new rules-set. Kingdomino and Mini Park finished at much the same time, which meant i was possible to re-balance the number of players a little, but not before the usual shenanigans regarding who wanted to play what. Although neither mentioned it by name, Burgundy and Ivory clearly had an eye on giving Yokohama another go. Time was marching on though and Yokohama isn’t a short game, and even without any rules explanation there is a lot to setup. The 10th Anniversary Edition of Puerto Rico was also available though, and there was just time to squeeze in a game provided it started straight away. So as Ivory had somehow managed to avoid playing it thus-far, we felt it was essential that we rectified the situation and Burgundy and Ivory started setting it up. With Blue joining Burgundy and Ivory, that left four people looking for something interesting to play, so Blue suggested Bärenpark. This another fairly light tile laying game, this time set in a bear park. Each player starts with a plot that will become their park, and the idea of the game is that on their turn, players place a tile from their personal supply on this plot. Each starting plot has a different array of symbols on some of the spaces, indicating different types of tiles. 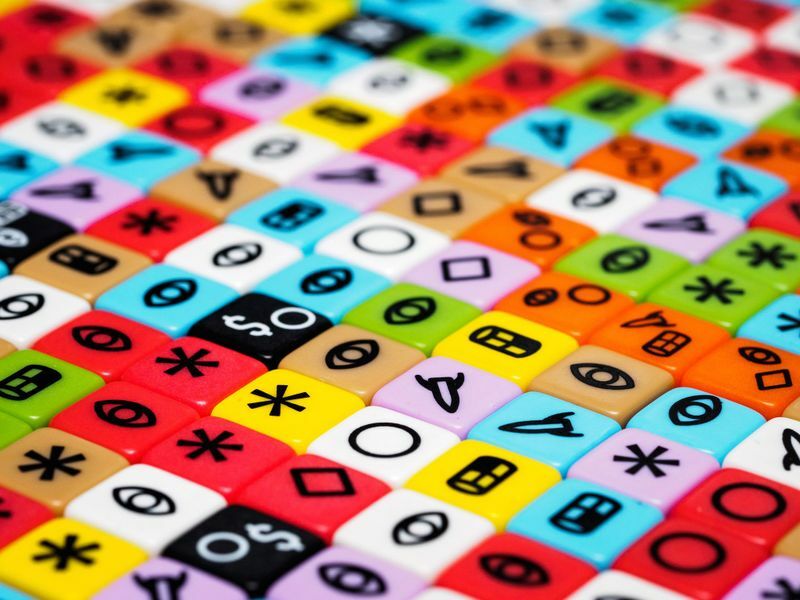 When these symbols are built over, the player takes more of the appropriate tiles from the general supply to add to their personal holdings. Some of these are small animal houses, some are larger enclosures and some are very small amenities like toilets and children’s play areas. Each tile also has a Construction Crew and a Pit providing the foundations for a Bear Statue. The Construction Crew allows the player to take an expansion board for their park, providing a new plot which they place next to their park. In contrast to the rest of the spaces, the Pit cannot be built upon in the usual way and is the last space to be covered in each plot; once every other space in a plot is covered, the owner can claim a statue from the display and place it over the Pit. These statues provide points, with the statues providing a diminishing number as the game progresses. Other sources of points include the animal houses and enclosures, but the number of these are limited and again, the earlier tiles are worth more. The small amenity tiles do not score points, but they allow players to fill in those awkward, difficult-to-fill, small gaps, enabling them to finish a plot and build a statue. Even these are limited, though to a lesser extent, so players need to be on the watch in case they are caught out. The game ends when one player fills all of their four plots and then everyone adds up their scores. After a little grumbling about koalas not being bears (the rules explain that “people like koalas, so we will be including them in our park!”), and a brief explanation from Blue, everyone started building. It was a fairly close game, but Black finishing with eighty-eight, seven points ahead of Pine in second place. Asked what he thought of it, Black’s comment was that it was a very simple game, but the group had been playing the basic game. The “Expert Variant” has achievement tiles which provide another source of points and make the game far more interesting for experienced gamers. Red, on the other hand, enjoyed the game much more, somehow finding in it the tessellation building thing that she had struggled to describe, but she had felt was missing in NMBR 9. Puerto Rico was still going, so the group moved on to one of Purple’s current favourites, Cat Lady. This is a light card game that got an outing last month as well. The game is a very simple a card drafting game, similar in feel to Sushi Go!, though with a very different drafting mechanism. On their turn, the active player takes all thee cards from one row or column in the three by three grid, marking the row they took with a kitty meeple. The cards are replaced from the draw deck and the next player then takes a different row or column. Cat cards go in front of the owner who must feed them before the end of the game or they score negative points. Any food cards yield cubes which can then be placed on the face-up cat cards to show they are being fed. Similar to Sushi Go!, there are also cards that score for the player with the most cards (cat “costumes”) and give players with the fewest negative points and sets that players can collect (toys). Players can also collect catnip cards which score minus two if the player only has one at the end of the game, or one or two points per cat if they have more. There are also lost cat cards, and discarding a pair allows players take a two victory point token or one of the three stray cat cards which are particularly useful because they have special powers. The tricky part is making sure that the food a player gets matches the cards, because cats are fussy creatures and some like tuna, while others will only eat chicken… At the end of the game, players score points for each happy well-fed cat and for their toy collection with extras if they have the most cat costumes. Unfed cats, having the fewest costumes, and the largest surplus of food will give players negative points. This time everyone went for different approaches with differing degrees of success. For example, Purple went for costumes and Pine went for toys; Black and Red both went for lots of cats and catnip, but Black failed get enough catnip to score, and actually ended up with negative points. It was very close between Pine and Red in the end, but Pine who had fewer cats (but very contented ones thanks to all the toys they had to play with), just beat Red with her larger number of cats that were all high on catnip. Time was getting on and Puerto Rico was just coming to an end giving them just enough time to watch the last few rounds. Puerto Rico was the number one rated game on the BoardGameGeek website for over five years and still commands a lot of respect though it has significant flaws. The problem is that there is very little randomness in the game which is great, but when a game like that is played a lot people become “experts” and there is a perception that there are right and wrong moves. In Puerto Rico, this point is exacerbated because of the way the game is played. In each round, beginning with the Governor, players take it in turns to chooses an action. Every player carries out the action, but the player that chose it gets a “privilege”, i.e. a bonus. The catch is that players that players need to watch what everyone else is doing in order not to give an advantage to an opponent, or worse, give one opponent an advantage while making life difficult for someone else (also known as “King making”). In Puerto Rico, players are plantation owners in seventeenth century Puerto Rico growing up to five different kind of crops: corn, indigo, sugar, tobacco, and coffee. Each plantation owner must try to run their business more efficiently than their competitors. First they must grow their crops then they must store them efficiently. Finally, players must sell their crops at the right time or ship their goods back to Europe for maximum benefit. In order to do this most effectively, the plantation owners must make optimal use of the arriving colonists and develop the capital city, San Juan, building useful amenities. Thus, the aim of the game is to get victory points which are awarded for buildings and for shipping goods. However, to build, players need money, and before they can ship goods, players need to be able to produce the goods with a plantation, and where necessary process them in the appropriate building. As Ivory had not played the game before, Burgundy was Governor for the first round and Blue went second, giving him a little thinking time before he had to choose an action. This has consequences for the setup, with Blue and Burgundy starting with an indigo plantation and and Ivory starting with a corn field. At first, Ivory couldn’t see why corn might be useful as selling it doesn’t give any money, however, he quickly realised that it doesn’t need a production building and therefore is quicker and easier to produce, making it ideal for shipping. Blue joined him and the pair were soon filling boats as often as they could. Burgundy meanwhile, had gone for the high value coffee. This took him a little while to get going, but once he had a coffee roaster he was able to sell his first batch of coffee and for a short while looked like he was going to storm ahead as he added sugar to his portfolio. Unfortunately, for him, once he had spent his coffee profits, Burgundy got a little stuck as Blue and Ivory worked together very efficiently to make life difficult for him. To begin with, Burgundy was able to ship his coffee, but as it is a high value produce, he really wanted to sell it and use the profits to build. That wasn’t possible though as the Trading House already had a coffee crate in it and until there were four different commodities there, no more coffee could be sold. Burgundy had been able to commandeer a ship for coffee, but once that was full, Burgundy was in an even worse position, because between them, Blue and Ivory were able to make it very difficult for Burgundy to ship two different goods types. The reason why this caused him problems was because of the Boston Tea Party Rule: after shipping, players are only able to keep one crate and anything else is lost over the side. Thus, to begin with, Burgundy was forced to ship when he didn’t want to, and then lost valuable stock when he couldn’t ship. And all the while, Blue and Ivory were collecting victory points for shipping their corn and a little sugar or indigo. Ivory had got off the mark quite quickly buying a Hacienda early on. It wasn’t till much later in the game when Blue bought a second that we realised we’d been playing it wrong and instead of choosing which extra plantation tile he got, he should have been drawing them blind. This had two consequences: firstly it gave Ivory a small, but potentially significant advantage, and secondly, it meant we didn’t run out of plantation tiles quite as quickly as we would otherwise have done. It couldn’t be fixed though, so we just carried on and as long their strategies were aligned, Blue and Ivory were worked well together. It wasn’t long before Ivory moved on to the next stage of his development and first built a Factory and then started raking in the cash every time he produced. Blue then built herself a Warehouse and upped her shipping rate and starting raking in the victory points. The game was coming to a close when the Big Question came up: Burgundy asked whether players were allowed to buy more than one large building. Both Burgundy and Blue had a vague recollection of the rule, but it couldn’t be found in the booklet. Ivory graciously switched his strategy and did something else, though checking later proved that was wholly unnecessary. The game came to a close as we ran out of on victory point chips and colonists (something that would have happened a lot earlier had we realised there should always be a minimum number arriving on the Colonists Ship), and all that was left was to tally up the scores and it was very tight indeed. Although he had lots of buildings, Burgundy’s shipping had been effectively stymied by Blue and Ivory and the shortage of colonists had also made things a lot more difficult for him than it should have been, despite all that though, he wasn’t far behind Blue and Ivory. In the end, Ivory won by a single point. There was no need to re-count as he would have undoubtedly won by far more if he had built that second large building, though perhaps that off-set some of the advantage he had received early on with his Hacienda. Learning Outcome: Sometimes it is best to play the “basic” game to get a feel for it before trying the advanced rules, but other times, it just feels trivial. This entry was posted in Games Night and tagged Bärenpark, Carcassonne, Cat Lady, Kingdomino, Mini Park, NMBR 9, Puerto Rico, Sushi Go!, Yokohama on May 1, 2018 by nannyGOAT. The evening began with Blue handing out Essen orders to Red (Sole Mio!, a relative of Mamma Mia! ), Green (Thunderbirds and all the expansions), and Burgundy (lots of Concordia and Orléans bits). Just to make sure Ivory and Pine didn’t feel left out, she had also brought a whole flock of boardGOATS to pass round – all suitably decorated. 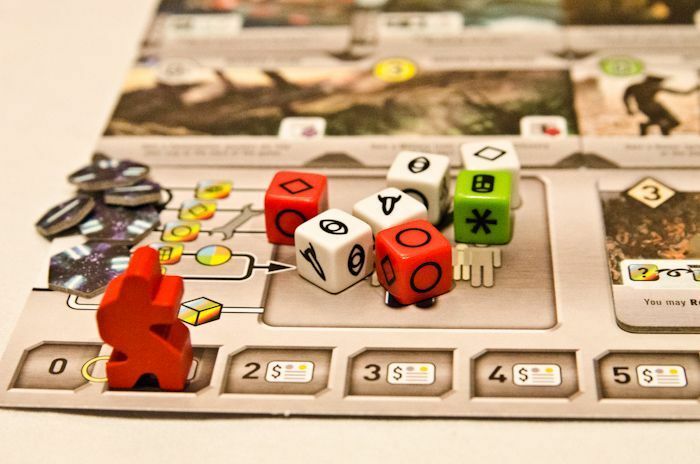 There was a lot of discussion of the games at Essen, but Spiel has grown so much over the last few years that it was impossible to see everything as was evident when Green trotted out the fruits of his research and what was “hot”. Altiplano, Clans of Caledonia, Photosynthesis, Gaia Project, Charterstone, and Noria were all completely missed for various reasons, but Pink and Blue had managed to look at Agra, Meeple Circus, and Kepler-3042 and had picked up copies of Keyper, Queendomino, Mini Park, Montana, Captain Sonar and Azul (Blue’s tip for Spiel des Jahres next year) among other things, all of which will no doubt appear over the coming weeks. With the chit-chat and pizzas over, it was definitely time to play something. With six of us, it was almost certainly two games which was fortunate as Green wasn’t keen on anything Halloween themed, which ruled out the “Feature Game”, Dead of Winter: A Crossroads Game. That wasn’t a problem though, as Pine was keen to play and everyone else was happy to be a third. In the end, it was Blue that joined them as she hadn’t played it before. With two novices, that meant a full explanation of the rules. Dead of Winter is a semi-cooperative game. There are a number of things that make it different from other, older cooperative games like Pandemic. For example, there is a group objective, but each player also has a secret, personal objective: players must achieve both to win. There is also the addition of a traitor, who’s objectives are counter to everyone else. Both Pandemic and Shadows Over Camelot have this mechanism integrated as part of an expansion, and in Dead of Winter, this is also optional, or (like another of our favourites, Saboteur) can be played in such a way that there may, or may not be a traitor present. So, at the start of the round, a card is drawn from the Crisis deck and then everyone rolls their dice and the first player takes their turn. This begins with another player drawing a card from the Crossroads deck. This player is supposed to read only the first line, unless the condition is fulfilled in which case they read the rest of the card. These are quite clever, as they end with two options—the eponymous “Crossroads”. The text on these cards adds a lot of atmosphere as well as adding to the sense of impending doom as sometimes the card might be activated by something the active player does. Each player starts with two Survivors and the active player has one die per character and an extra one. The Survivors have special abilities and the dice are “spent” by them carrying out actions. For example, a player could attack a zombie which costs one die, but the value of the die needed will depend on the character: James Meyers who is a bit of a wuss, is rubbish at fighting and needs a six, on the other hand Thomas Heart is a violent sort who loves a good brawl and anything at all will do. As well as attack a zombie, there are a number of other actions that require a die, including search a location, clean the waste, and build a barricade. Searching is the only way players can get Item cards. Around the central game board, there are a number of special locations and each one of these has a pile of Item cards. The distribution of the different types vary and depend on the location, for example, weapons are unlikely to be found a the hospital, but medicine is quite prevalent. Like attacking zombies, ability to search depends on the different characters and some Survivors have a special ability which means they are good at searching in a particular location. In contrast, anyone can build a barricade or take out the bins, so these actions can be carried out by anyone with any dice, as long as they are in the right place. In addition to actions that require a die, players can also play a card, help deal with the crisis, move a Survivor, turn food cards into food tokens, request cards from other players, hand cards to other players or initiate a vote to exile someone. While there are lots of things players can do, there are also hazards along the way. For example, moving from one location to another is risky, so the Survivor must roll to see what damage the exposure did. It may be that they were well wrapped up and nothing happened, but it is also possible that they were wounded in the attempt, or caught frostbite which is nasty because the effect progresses in later rounds. Worst, of course, is getting bitten because the Survivor dies straight away and the effect spreads to other Survivors at the same location (who also have to roll the exposure dice). Once every player has taken their turn, the zombies swarm, arriving at each location that where there are Survivors, with extras attracted by noise. If a location gets overrun by zombies, they start killing Survivors. Every time a Survivor dies, they Colony’s moral drops. The game ends moral gets to zero, the requisite number of rounds have been played or if the main objective has been completed. Our main objective was simply to survive the five rounds we were to play. Blue began with a serious lack of practical ability in David Garcia (accountant) and James Meyer (psychologist). Fortunately that was made up for by Ivory and Pine who began with Thomas Heart (soldier), Andrew Evans (farmer), Janet Taylor (Nurse) and Edward White (chemist). Andrew Evans, Janet Taylor, Edward White and David Garcia all had special abilities when searching and Thomas Heart was excellent fighting off zombies, while James Meyer just had an especially uncool anorak. We started well and for the first couple of rounds, the zombies were only faintly annoying and the biggest issue was fulfilling the requirements of the Crisis Cards. Early on, Ivory armed Andrew Evans with a rifle which enabled him to take out any one of the undead, something that proved very handy and made up for the enormous amount of noise Andrew Evans had been making during searching. During the second round, Blue gained an extra couple of characters (Buddy Davis and Harman Brooks), which gave her extra dice and more special abilities she could use, but the downside was they came with a load of extra helpless survivors (folk that are a bit of a dead-weight and just need a lot of feeding). It seemed like a gamble, but in the third round, Ivory “found” Sophie Robinson (a pilot) as well. By the end of the third round, it was clear the message had got out to the zombie hoards and they were coming to get us (possibly due to the racket that Ivory had been making with Andrew). The fourth round was tight especially as everyone’s attention began to turn to their secondary goals. The otherwise fairly useless James Meyer suddenly found himself some courage and a baseball bat and set about the un-dead with great gusto. Pine decided that he really, really wanted that extra character that he’d been persuaded out of earlier in the game and acquired Alexis Grey, a librarian with an ability to search the library efficiently. Going into the final round, we had to be a little careful in a couple of areas and moral was low, but it was clear that unless one of us turned out to be a traitor, the game was won. And so it turned out: there was no traitor and it was just a question of who had succeeded in their secondary goal. At the start of the game, Pine had been highly conflicted, needing medicine for Edward White’s special power, but also having a goal of needing to finish with two at the end of the game. Since he started his final turn with no medicine, he thought the boat had sailed, but with his very last action, he happened to draw two medicine cards to satisfy his second objective. Ivory also needed two medicine cards for his goal and had managed to hoard these throughout the game. Blue’s challenge was more difficult as she needed the colony to have lost three members to the hoards. Despite her best efforts to kill off some of her own Survivors, Pine and Ivory had generously helped keep them alive, so she failed dismally, the only one not to complete both victory requirements. Meanwhile, on the next table, Green and Burgundy were teaching Red how to play Puerto Rico. This is a much older game which was the highest rated game for many years and is still well regarded. Red had never played it and it was a very long time since Burgundy or Green had played it as well, so they were keen to see how it held up against some of the more modern games. In Puerto Rico, players are plantation owners in seventeenth century Puerto Rico growing up to five different kind of crops: corn, indigo, sugar, tobacco, and coffee. Each plantation owner must try to run their business more efficiently than their competitors. First they must grow their crops then they must store them efficiently. Finally, players must sell their crops at the right time or ship their goods back to Europe for maximum benefit. In order to do this most effectively, the plantation owners must make optimal use of the arriving colonists and develop the capital city, San Juan, building useful amenities. The flow of the game is quite straight-forward in that on their turn, the active player chooses a “role” then everyone takes it in turns to carry out the action associated with that role. Each role has a “privilege” which the active player gets which gives them a little bonus (as well as the opportunity to take the action first. Once everyone has chosen a role, the remaining role cards are “improved” by the addition of money, the used role cards are returned to the pool and the start player (The Governor) moves one player to the left before the new Governor starts the next round. The aim of the game is to get victory points which are awarded for buildings and for shipping goods. However, to build, players need money, and before they can ship goods, players need to be able to produce the goods with a plantation (and where necessary process them in the appropriate building). Each building/plantation has a special bonus, but for a player to receive this, the building needs to be occupied by a “colonist”. All these activities are carried out through the role cards. For example, the Builder enables players to construct a building, but the player who chooses the role gets the privilege of paying one doubloon less than they would have done otherwise. Similarly, the Craftsman is used to produce, but the privilege allows the player who chose the role to produce one extra item (of those they had already been able to produce). Other roles include the Captain (enables players to ship goods); the Trader (allows players to sell goods for money); the Settler (players can take a plantation tile and add it to their island); the Mayor (the ship of “Colonists” arrives and they are divided among the players), and the Prospector (everyone does nothing except the person with the privilege who takes a doubloon from the bank). The game ends when either, one player has built their twelfth building or the supply of victory points or colonists has been exhausted. The first few rounds were a little tentative. Green started with the Governor (through random selection) and chose the build action first. Burgundy chose Mayor using his extra citizen to occupy both indigo plantation and production building. Red needed a little help to suggest that she place her citizen on her Corn rather than her small market since this would enable her to produce something, whereas in the market she would have nothing to sell. So inevitably Red then chose craftsman. This gave Red a two corn, Burgundy an Indigo and Green nothing as he only had indigo and one citizen. From there, the game progressed as you might expect, with each player following a different strategy. Green relied on his indigo resources and built a Small Market and an Office (so he could sell multiples of the same type of goods), dug a couple of quarries, and clearly went for a money and buildings strategy. When he started losing out in the Captain (shipping) phase he was able to very quickly buy a Wharf and always managed to ship something and thus stay in the running on victory points. He was the first to buy a big building of course and chose the one which gave him extra points for production buildings believing he could fairly easily add to his already reasonable tally. 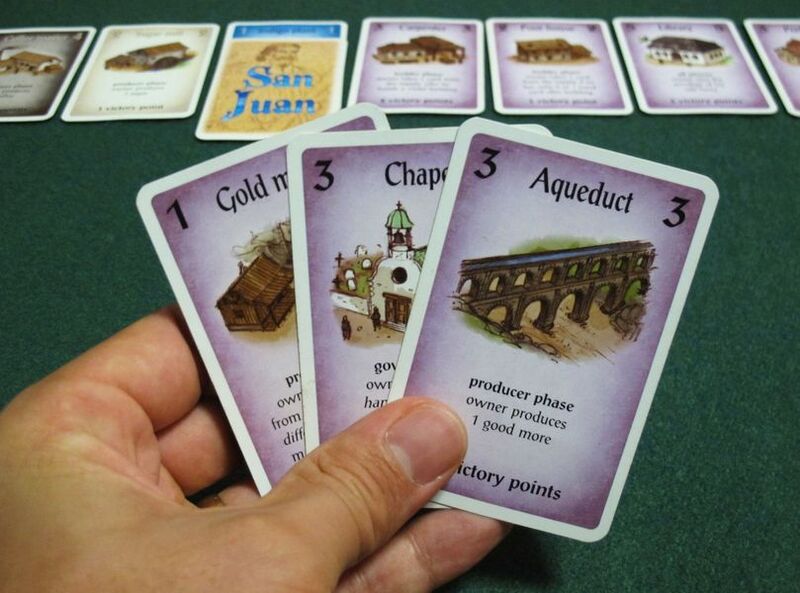 Burgundy went for a diversified portfolio of goods and as able to add a factory building which started to really rake in the money with four different types of goods. He was only missing corn, which he easily added to make an extra five doubloons every time craftsman came up. As a result he was not far behind Green at buying a large building. Since he had been shipping regularly and gathering victory points Burgundy took the building that would give him an extra point for every four points he had, however about half way through the game he began to struggle with his shipping. Red had begun to regularly take Captain, which meant that he was last to load and would often miss out being able to load all his goods—without any kind of warehouse was regularly losing all his stock of two or three goods each time. Eventually, he had enough of this and decided to do something about it. The choice was between a Wharf and a Harbour: increasing his victory point income every time he shipped, or gain an extra ship he could always ship to. It was a tough choice, but in the end he chose Wharf only to then discover he did not have quite as much money as he thought and so had to settle for Harbour after all. This nearly proved his undoing in the end, as with two or three more captain actions happening he still found himself unable to ship everything, losing several goods in the process—Red and Green made quite sure of that!! Red’s game was a little more tentative, as she found her feet, trying to figure out how the game all hung together. She struggled a bit with getting the buildings and plantations all occupied in the right way to produce what she needed. She ended up with a lot of Sugar, but her small warehouse meant that early on she did not have to discard it and was able to make a large shipment later on, locking out Burgundy, the other Sugar producer in the game. In the end she ended up with more citizens that she had spaces and so for a while had an occupied Indigo Production building but no Indigo Plantation. It seemed it didn’t really matter though, as she had a good thing going on with the Captaincy, shipping large amounts of Sugar regularly giving her a regular supply of points. With everything else that was going on, Red didn’t get round to buying a large building. As the game neared conclusion, we thought we would run out of Citizens first, but selection of the Mayor slowed and Captains became a more regular feature so the victory points dwindled fast. Green was worried that he might not get his large building occupied before the victory points ran out, so when he became Governor for the last time, he chose the Mayor in an effort to extend the game, much to Red’s chagrin. She claimed that it was allowing Burgundy to get his large building occupied and thus gain more points, which is true, but it helped Green too. In the end it was Red’s Captaincy that ended what proved to be an incredibly close game; Puerto Rico is not a game we usually think of as being so well balanced that the scores are always close. The hidden victory points and various other ways to gain points tend to keep players guessing right til to the end and it is usually possible for one player to quickly build an efficient engine which wipes the floor with everyone else. That wasn’t the case this time. Although the actual game play is quite simple, Puerto Rico can be a challenging the first time as it is hard to really work out the best way to play, and things only become clear after two or three rounds. So Red did really well, not only to keep pace with two experienced players, but especially to take second place against two players, scoring fifty points. Green’s lack of resources to ship, even with his wharf, let him down and it was Burgundy, who scraped a win with fifty-three points. While packing up, there was a lot of discussion about the game: did Green really hand Burgundy victory by choosing that Mayor? We concluded probably not, as if Burgundy would have chosen it if Green hadn’t. Puerto Rico used to be the gamers’ game of games for quite a few years, until Agricola elbowed its way to the top. Since then that top spot has been fiercely fought for and, as in Formula 1, (where everyone now talks about Schumacher, Vettel and Hamilton), everyone seems to have forgotten poor old Juan Manuel Fangio, the unsurpassed master for decades. Once in a while it’s good to bring out the old tapes and watch the old master at work though, and so it is with Puerto Rico. After so many years it was interesting to see how it stacked up against the newest masters of the gaming world. We concluded that it still competes very well: it has variety and simplicity at its heart, great interaction and just enough complexity to make it a challenge without needing a PhD just to understand the rules. Dead of Winter was still going and it sounded like there was another half an hour play, which meant there time for another, shorter game, and the group settled on Coloretto. Everyone knew it quite well it was a quick start. On their turn the active player either draws a coloured chameleon card and places it on a “truck” or, they take a truck and its chameleons (which means they’re out for the rest of the round). The idea is that players are collecting sets of cards, but only three will yield positive points, with the rest scoring negatively. There are some “special” cards as well, including multicoloured joker chameleons and “+2” cards which give an extra two points at the end of the game. So, everyone was shocked when a “+3” came out of the pile came. Clearly there were some expansion cards in the deck and nobody had noticed despite having played with it several times before. The first round was also remarkable in that first a yellow card was pulled, then a purple (placed on a different pile), then another yellow, which was placed on the purple pile, then a purple, which was placed on the yellow pile, to make two identical piles. So, what were the colours of the next two cards? Yes, yellow and purple! Burgundy and Red bailed at this point but Green decided to see where if he could get a second yellow or purple and ended up with a red instead giving him three singletons. From there, the game progressed in the usual way. Green collected more new colours each with only one card, but that meant he had a wide choice to specialise in. Eventually he chose green as his primary colour, which the others found difficult to prevent him from getting. Burgundy was trying to keep his number of colours down, concentrating on just brown and yellow, but Red and Green kept ganging up on him to make sure he had to take something else very time. To get round this, he ended up taking single cards several times, but that meant he didn’t get as many cards as he might otherwise have collected. Red was the lucky one who took the rainbow joker and otherwise went for blues and purples. She was forced to collect too many other colours though. In the end, it was again Burgundy who managed to eek out the best score, despite Red and Green’s combined best efforts. Learning Outcome: Sometimes winning is impossible, even with teamwork. This entry was posted in Games Night and tagged Agra, Agricola, Altiplano, Azul, Captain Sonar, Charterstone, Clans of Caledonia, Coloretto, Concordia, Dead of Winter: A Crossroads Game, Forbidden Desert, Forbidden Island, Gaia Project, Kepler-3042, Keyper, Mamma Mia!, Meeple Circus, Mini Park, Montana, Noria, Orléans, Photosynthesis, Puerto Rico, Queendomino, Shadows over Camelot, Sole Mio!, Thunderbirds, Thunderbirds: Above & Beyond, Thunderbirds: The Hood, Thunderbirds: Tracy Island on November 14, 2017 by nannyGOAT. The hungry were feeding when an itinerant gamer from the north-west wondered in to join us. In the area for work, Yellow has been visiting several local game groups recently and was nice enough to come and join us for the evening. In addition, Grey made another unexpected appearance; apparently Cerise was away with the little one, so he was free to come out and play with us. Unfortunately for them though, our start was delayed a little while Blue and Burgundy scoffed their supper as quickly as they could and everyone else talked politics. Normally politics is a topic of conversation people avoid for fear of arguments, but it is amazing how everyone in the group seems to agree at the moment. In fact, as the evening wore on, it felt like history was being made as we watched: news come in that the Labour NEC had decided that Jeremy Corbyn should be able to stand as leader without needing the usual support from members of the Parliamentary Party, and the Petitions Committee had decided to schedule a referendum debate for 5th Sept, following the petition that garnered over four million signatures. Eventually, we decided to get on with it with Blue and Magenta keen to play the “Feature Game”, Puerto Rico. Surprisingly (as Puerto Rico is Green’s favourite game and it was with him in mind that we chose it), Green was keen to play Amerigo instead. He had missed out on playing it on Friday night with the Didcot group and it had clearly been playing on his mind over the weekend. By the same token, Burgundy and Black were less keen to play Amerigo as they had played it on Friday and they quite fancied Puerto Rico instead. Purple had played it on Friday, but was keen to play again, so the group naturally split into two with Pine joining those playing Puerto Rico and Grey and Yellow joining the Amerigo group. Puerto Rico is an older game, and in many ways the archetypal Euro game. The idea of the game is quite simple in that on their turn, the active player chooses a “roles” then everyone takes it in turns to carry out the action associated with that role. Each role has a “privilege” which the active player gets which gives them a little bonus (as well as the opportunity to take the action first. Once everyone has chosen a role, the remaining role cards are “improved” by the addition of money, the used role cards are returned to the pool and the start player (The Governor) moves one player to the left before the new Governor starts the next round. The aim of the game is to get victory points which are awarded for buildings and for shipping goods. However, to build, players need money, and before they can ship goods, players need to be able to produce the goods with a plantation (and where necessary process them in the appropriate building). Each building/plantation has a special bonus, but for a player to receive this, the building needs to be occupied by a “colonist”. All these activities are carried out through the role cards. For example, the Builder enables players to construct a building, but the player who chooses the role gets the privilege of paying one doubloon less than they would have done otherwise. Similarly, the Craftsman is used to produce, but the privilege allows the player who chose the role to produce one extra item (of those they had already been able to produce). Other roles include the Captain (enables players to ship goods); the Trader (allows players to sell goods for money); the Settler (players can take a plantation tile and add it to their island); the Mayor (the ship of “colonists” arrives and they are divided amongst the players), and the Prospector (everyone does nothing except the person with the privilege who takes a doubloon from the bank). 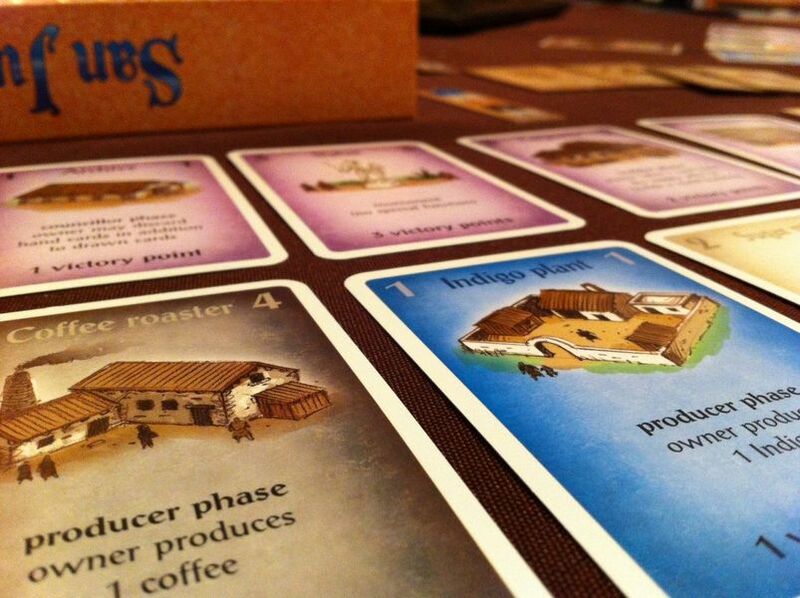 The “colonists” arrive by ship, are dark brown and work on the plantations, so many gamers have assumed the term is a pseudonym for African slaves and in the USA this means some people have refused to play the game. We are not like that in our group and, though we have no problem talking about slaves, we had far more fun talking about “colonists” in a way that everyone knew what we really meant. What with that and the references to the Big Meerkat (that’s in the centre of Newcastle you know), the Orifice building (otherwise known as the Office), Worf (Son of Mogh), and the Big and Little Whorehouses (or perhaps they were really warehouses), much of the game was carried out in a sort of code. This special group understanding was continued in the game play too where Magenta kept getting in Burgundy’s way, much to everyone else’s obvious delight, though Magenta insisted that it was all purely accidental. Burgundy started, so he, Blue and Black began the game with an indigo plantation while Magenta and Pine started out with a corn field. Pine found it quite hard to see what we needed to do, but he soon got past that and, as the game wore on, he quickly monopolised the tobacco market. He remained the only player dealing in tobacco for most of the game which was quite important due to the way shipping works: when a player chooses the Captain role, players take it in turns to place goods on one of the three ships. Each ship can only carry one type of cargo and they all have a finite space. As the only player shipping tobacco, whenever Pine was able to transport some of his tobacco he simultaneously prevented others from shipping their goods. Since this is the key way to get victory points, before long, Pine had built a sizeable pile and looked to be romping away with it. Meanwhile, Black, then Magenta and Burgundy moved into sugar which made them uneasy allies, sometimes working together to get sugar into a ship, but otherwise competing to get their goods into the last space on a ship. While everyone else was engaged in building a productive plantation, Burgundy began by by using his land for quarries, lots of quarries. These make building cheaper, but don’t provide goods when someone chooses the Craftsman role. Seeing where he was going, Magenta picked up a Construction Hut which enabled her to choose a quarry instead of a plantation each time anyone chose the Settler role. Blue managed to pick up one quarry, but otherwise, between them, Burgundy and Magenta were in danger of getting all of them. Burgundy got round the potential for a lack of plantations by building a Hacienda which gave him an extra plantation every time anyone else Settled. He then coupled this with Hospice which meant that one of these plantations/quarries arrived complete with a “colonist” – a very powerful combination. For a long time Black havered over whether to try to get in on the quarry game or not. To begin with he decided not before picking one up anyhow. Pine was sat next to Magenta quietly coveting her Construction Hut, but it was pointed out that it wasn’t a good time to buy it and there were better things he could do, advice he took. It obviously rankled a little though because every time after that when quarries were mentioned he added, “Though I’m not allowed a quarry…”. Eventually, Blue decided she was struggling from a lack of both cash and victory points and needed to do something drastic to get back into the game. So, taking a leaf out of Pine’s book, she expanded into coffee and then screwed everyone else up by starting a coffee ship which took several rounds to fill. Eventually, she was joined by Pine who then variously helped her and got in her way. Blue and Black both made a hash of their timing with the crafting and shipping, and when Blue finally worked out what she was doing and planned what she needed for a large building she lost the plot and failed to choose the Builder role when she had the chance. So, when Magenta took the builder a couple of turns later, everyone had enough for a large building and Blue was left without her first or second choice. Magenta who had filled less than half her plantation spaces took the Residence just to stop Burgundy and Blue who had been able to fill theirs and would have been able to get maximum points for it (thanks to their Haciendas). So, Burgundy took the Fortress (which gave him one point for every three “colonists”) and Blue took the Customs House (which gave one extra victory point chip for every four already held). This left Black with the dregs from which he took the Guild Hall (giving him points for his production buildings). Meanwhile, Pine ominously kept producing vast amounts of tobacco and shipping it. By this time, Blue and Black were convinced that Pine was miles ahead, and everyone else was playing for the minor places. Pine in turn was convinced Magenta had a healthy lead; Magenta was certain she was losing, but continued to innocently obstruct Burgundy and the game turned nasty as everyone began to struggle to ship what they wanted. With the number of victory point chips available dwindling faster than the number of “colonists”, everyone scrabbled to build that last utility and ship those final crates. It turned out that it was a very close game: Magenta had a misleadingly large pile of singleton victory point chips; Pine probably would have won if the game had the game ended a round or two earlier, and Burgundy may well have won had it gone on another for another couple of rounds. In the end though, despite being quite convinced she was nowhere close, Blue finished in first place with fifty-six, just three points ahead of Pine with Black taking third on a tie-break. Meanwhile, on the next table, Amerigo was going full steam ahead. In this game players are exploring the islands of South America, securing trading routes, and building settlements. The game board is made up of a four by four grid of large tiles that make an archipelago. Players then have two ships each which they sail through the maze of islands, mooring at natural harbours to build trading posts, and then expanding settlements. The actions available to players are determined through the use of a special cube tower that contains lots of buffers and buttresses. The idea is that each of the seven actions has an associated set of coloured cubes: blue for sailing, black for loading cannon, red for buying buildings, green for settling etc. At the start of the game, all the cubes are put into the top of the tower a small number get stuck and remain inside the tower to be potentially knocked out at a later point in the game. There are four rounds and each round consists of seven phases, corresponding to each action where all the cubes available of that colour are poured into the tower. Most of these cubes come out again, but some dislodge cubes previously caught in the baffles, while others others get stuck themselves. Of the cubes that come out, the colour that is in the majority dictates the number, while all the colours dictate the actions. Thus, if five blue, one green and one black come out, players can choose between sailing, building settlements or loading cannon, and in each case, they have five “action points”. So, the actions that are available are largely predictable, with a slightly random element meaning there is a tactical element (taking advantage of the actions currently available in the best way possible) as well as a strategic (long term plan) element to the game. Points are available throughout the game for all sorts of things, including being the first person to land on an island and establish a trading post; building settlements on an island; completing an island by settling on its last available space; collecting gold, and moving along the progress and special action paths. At the end of each round, however, the pirates attack and players have to fire their cannon to repel boarders. Anyone who has not loaded sufficient cannon to fend off the pirates, loses points which is particularly nasty, because these players lose as many points as they would if they’d had no cannon at all, and they also have to fire the cannon they had loaded! Inevitably we all started off sailing to islands near to us, and generally we all did the main colour action in the first round. Grey toyed with the idea of not doing Cannon’s, but in the end decided to copy the more experienced players. So an easy and simple, first round, in a game that gradually became a more cut throat battle. Purple concentrated on running up her brown track and gaining the bonus action chits and spread across to a few islands. This strategy seemed to leave her struggling for points as the game went on. Yellow was unsure how best to approach the game, so tended to stick to the action colour sequence, but got hold of the red equals green equals red bonus chit, which he used to good effect to build up on his several islands. This strategy netted him a good haul of points as the game progressed. Grey was running an expansionist policy, getting to as many islands as he could. On top of this he, quite slyly, built over the extra empty trading post spaces, thus rendering them useless and gaining a monopoly on several islands, however, his score also seemed to suffer for this. Meanwhile, Green carried out a number of red planning actions to build up a large backlog of buildings to place. This meant he always had something to place in those tricky corners, but he lost out on his big islands by leaving it too late to place them. Early on, he nabbed the big six neutral tile (the only one in the game) and then realised that he was on the wrong side of the big island to be able to place it, so had to make a quick trip to the other side to develop a new trading post before he could place it for a whopping eighteen points. This strategy was proving quite productive and he and Yellow were regularly vying for the lead. In the last part of the game, while Purple and Yellow continued their general strategy, Grey decided he had enough islands and started to place his tiles on them to gain the resources. Green, having built as much as he could, was left wondering what to do next. He had lots of tiles still to place, but nowhere to place them without a new trading post. There were four left, all on the other side of the board and they were disappearing fast, so green started sailing. By using his gold and going round the outside he was able to get to the area in just one move. By this time, there were only two trading posts left as everyone else worked together to stop Green. With no more gold, Green was not quite able to get to a trading post and ended just one space away. Yellow took his turn and he built on the other trading post leaving Green to sail once more and place his trading post. With only two single spaces left on this last island, there was a bit of a stand-off between Yellow and Green: whoever built first would gain a single point, but leave the other to get the three point bonus for finishing the island. Meanwhile, there was a total of eight pirates on the board which everyone had covered until Purple took the two-plus pirate attack bonus token. Purple was aright of course, but everyone else needed another two cannon if they weren’t going to end up with an eight point penalty. More turns were sacrificed to gain cannon which also sent players to the top of the line and provided extra gold. Purple and Green found themselves with no actions to do, so ended up trading action cubes for gold, while Grey and Yellow mopped-up island bonuses. In the very last action everyone swapped their gold for extra spaces on the white turn order track, just to get to that extra scoring location. With the game coming to an end and neither Green nor Yellow prepared to give quarter on the last island, neither took the final three points. Before the final scoring began, Yellow was in the lead, a few points clear of Green. As the final scoring phase began, it became apparent that everyone except for Purple had misunderstood the scoring the resource bonuses. We thought the number on the yellow action chits was its multiplier value, however, this number is irrelevant to the scoring, it only means it costs more to obtain. Grey was particularly annoyed as he had deliberately been going for the high value action tokens and had been choosing the resource tokens appropriately. In the end, it was very close with Grey and Purple catching up however, it wasn’t quite enough, and Yellow and Green remained several points ahead, tied on a hundred and thirty-one. The tie-breaker gave it to Yellow, as he was at the end of the turn order track and Green was five spaces farther back. On reflection though, Green later realised that he could have taken it had he known the rules better as he’d finished with six gold. He could easily have spent the surplus gold to move along the track, but had decided against it as, although it would have given him an extra five points, the gold was worth one point each so there had seemed no point. Puerto Rico was still underway, and with Grey deciding he could do with an early night (while the Cat’s away, the Mice will play – and it seemed this Mouse had been playing quite a bit! ), Purple, Green and Yellow opted for some quick, light-hearted fun with Om Nom Nom. This is one of our more popular games, and we’ve played it a few times on a Tuesday evening. Purple loves it and it was new to Yellow though, so despite his conviction that it’s completely random, Green joined in. The idea is quite simple, each player has a hand of “Predator” cards, and the dice represent “Prey”. 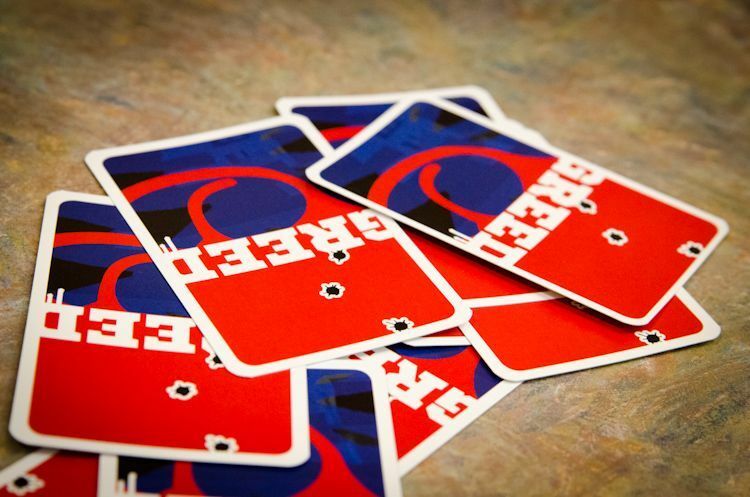 Players simultaneously choose a card to play and then Prey is divided up accordingly. If there is enough Prey for all the Predators to eat, then players take their share of the appropriate dice. If not, the Predator(s) go hungry and the cards are discarded. The catch is that some cards are both Predator and Prey, which is where the game descends into double-think (or Luck as Green prefers to think of it). Green has tried a variety of “methods” to beat the “luck”, but much like an inveterate gambler, a “technique” that works a couple of times almost always fails in the end, and so it proved this time too. In the first card of the first round, Green decided to change his card just before everyone revealed theirs which proved fortuitous as his hedgehog ended up with a bunch of frog dice and cards. So, Green swapped his second and third cards at the last second and he picked up Prey on both occasions. As the round progressed, Purple and Yellow also achieved some success and Green took another card, but by the end of the round, the scores were very even with Purple ahead by just one point. Probability can be a funny thing, but it was still quite a shock to roll nine carrots, each with a probability of one-in-six. And so began a little game of cat & mouse, literally with everyone trying to second guess each others choices and all ending up feeling that the carrots looked too good to be true and there was bound to be a fox hanging around. At the second attempt, Yellow found he couldn’t resist temptation and went for the carrots only to find Purple’s fox was waiting to pounce. Then, somehow (and nobody could work out exactly how), Purple ended up with the entire haul of carrots all to herself. By this time, Green had reverted to type and scored nothing for the round, Yellow produced a creditable showing, but Purple took an amazing twenty-nine points. The final round was a much more even spread of dice and scores. Yellow was getting better and better and won the round while Green got lucky and took a few more points. Purple was not so successful this time out, but it didn’t matter, as her massive score in the second round gave her a record-breaking forty-eight, according to the scoring card, a new high score! Learning Outcome: Don’t ascribe to luck what others might call skill. This entry was posted in Games Night and tagged Amerigo, Om Nom Nom, Puerto Rico on July 21, 2016 by nannyGOAT.